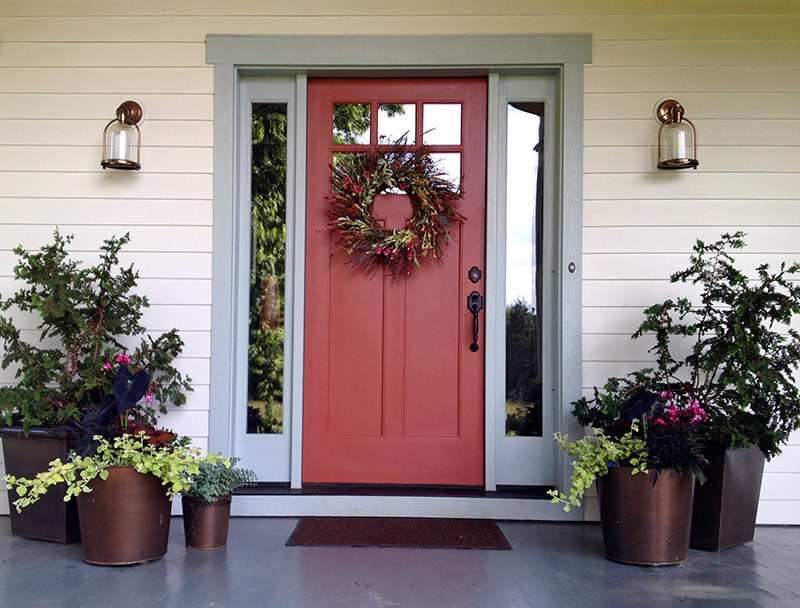 It’s finally time for one of my favorite gardening days of the year: redoing the front porch containers. Each spring, after the winter’s pansies poop out from rising temperatures, I get the instant gratification of putting together tiny minigardens to be appreciated up close each time I enter the house. This year my mom and I discovered a fantastic greenhouse, Milmont, over the mountain in Stuarts Draft. 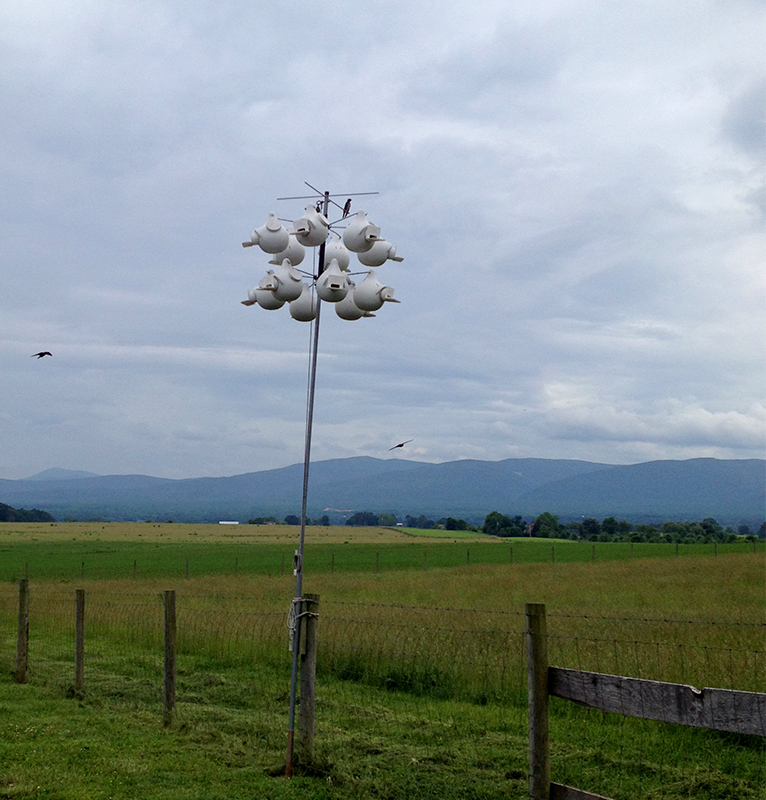 Not only did they have varieties of plants that have been on my wish list for ages, and that I’d resigned myself to having to mail-order, they also had a thriving colony of purple martins living right near their greenhouses. Awesome, rare birds + spectacular, rare plants = pretty much my idea of heaven. 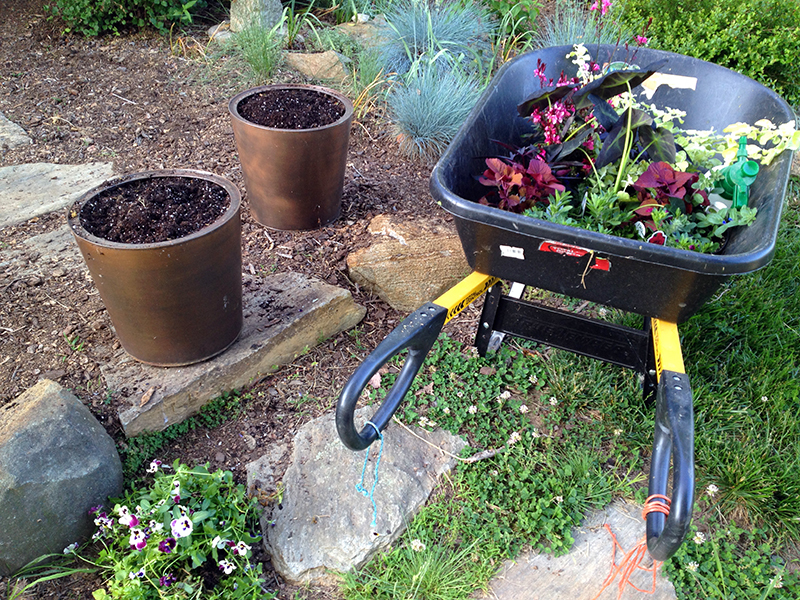 I came home with all the material for this summer’s container gardens and broke down the old arrangements, composting the spent pansies and then refreshing the pots with new soil and granular fertilizer. Then I got down to designing. 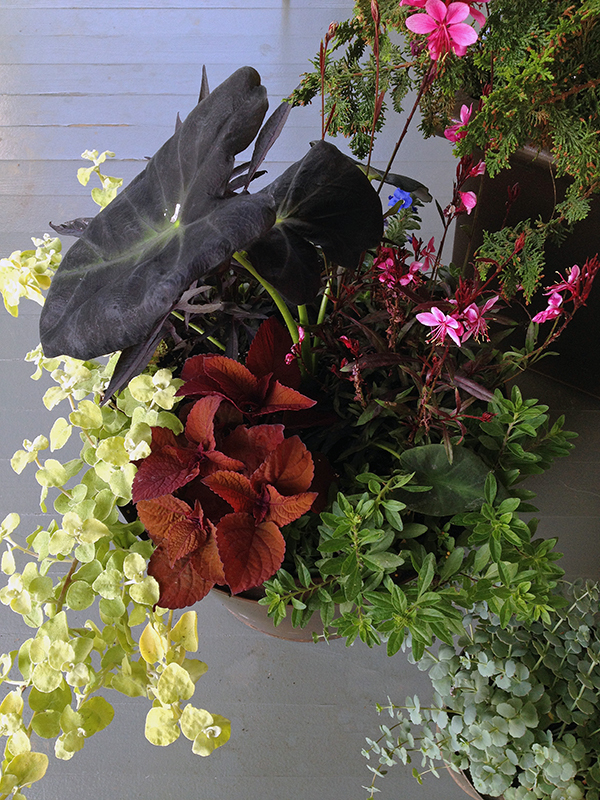 The key to good containers, in addition to following the “thriller, spiller, filler” formula, is to stuff in way more plants than you think could fit. 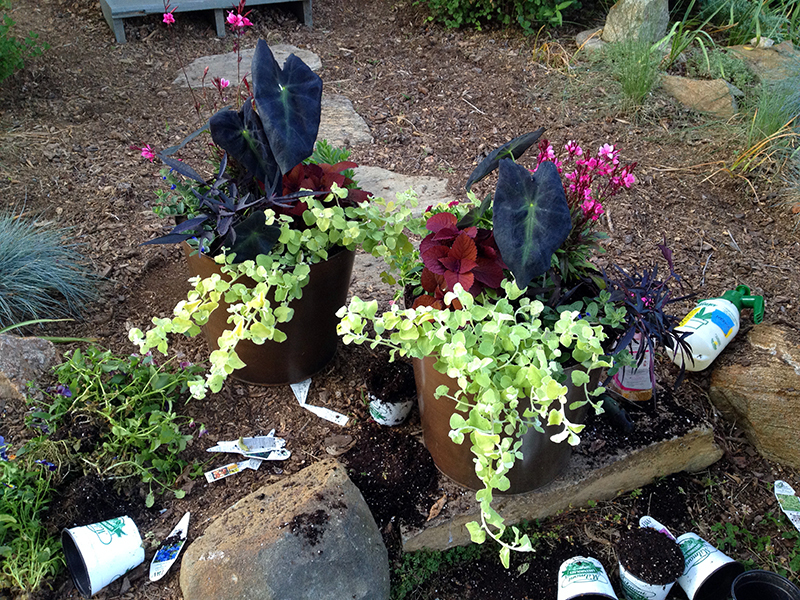 Yes, containers planted this fully require more attention with watering and feeding, but you get an instant, lush look. I already know that some of these plant will, if they’re happy, grow too large for these containers, so throughout the summer I will need to keep them trimmed and shaped up to continue looking nice. Not a hard task, and the added bonus is I can root the trimmings and make more plants! The front porch, all dressed up for summer: the large evergreens below are some form of Chamaecyparis, which I’ve had for more than two years. They are very slow-growing and do okay in pots as long as they don’t dry out, but eventually they will need to be planted out in the yard. I refreshed their soil last year. The plant in the smallest pot is Sedum ‘October Daphne,’ which I cut back each winter for fresh regrowth. Snowplows are rumbling outside my window, the white stuff’s still coming down, and temps are cold enough to warrant a red-light district in the chicken coop. 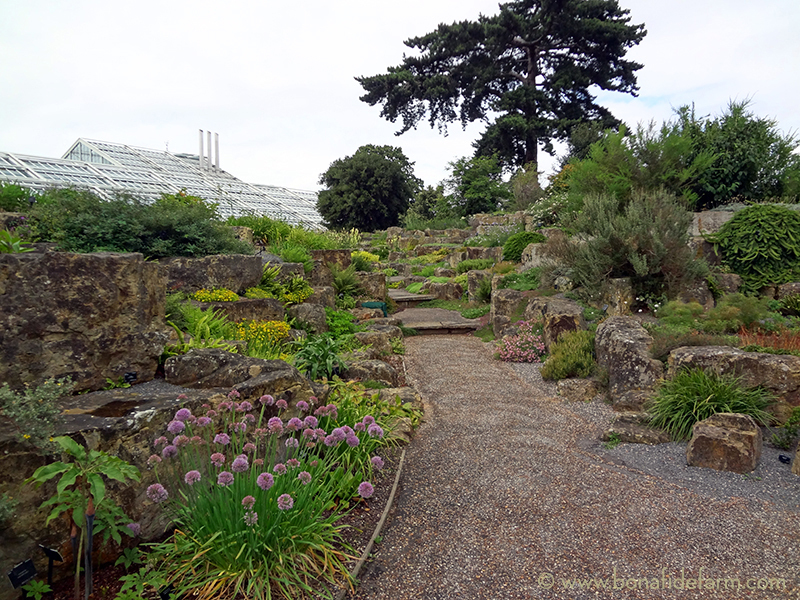 Sounds like a great time to revisit England in July, this time to the Royal Botanic Gardens, Kew—a must-see spot on any gardener’s tour of England. Kew was founded in 1759 and declared a UNESCO World Heritage Site in 2003. I thought that seemed pretty old until I looked up the world’s oldest botanical garden, which is in Padua, Italy and was created in 1545. The Padua garden is also a World Heritage Site, according the UNESCO, “considering that the Botanical Garden of Padua is the original of all botanical gardens throughout the world, and represents the birth of science, of scientific exchanges, and understanding of the relationship between nature and culture. It has made a profound contribution to the development of many modern scientific disciplines, notably botany, medicine, chemistry, ecology, and pharmacy.” Most people don’t immediately think of all these far-reaching implications of gardening, but there you have it, and it’s all true. But that’s enough trivia—we came here to see Kew, and Padua will just have to join the very long list of gardens yet to be visited. 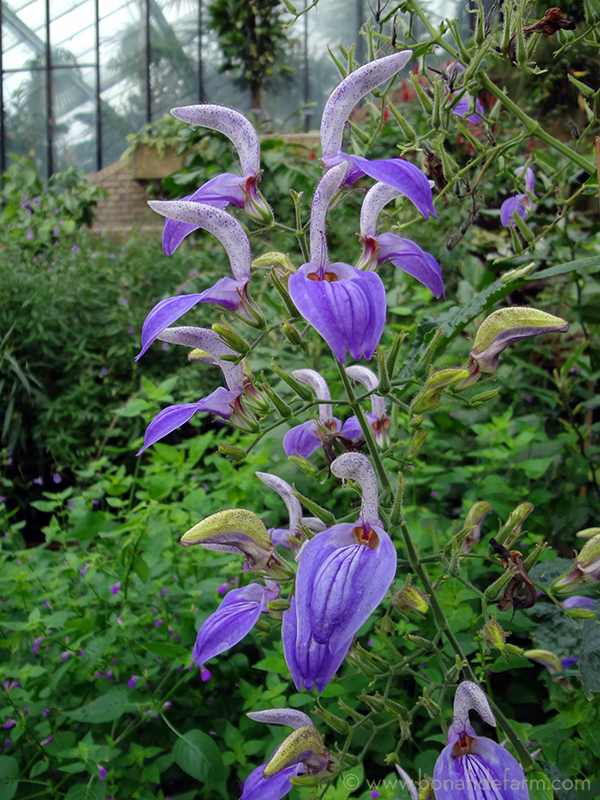 In addition to being a top London tourist attraction, Kew is also a research institution for plant science and conservation. 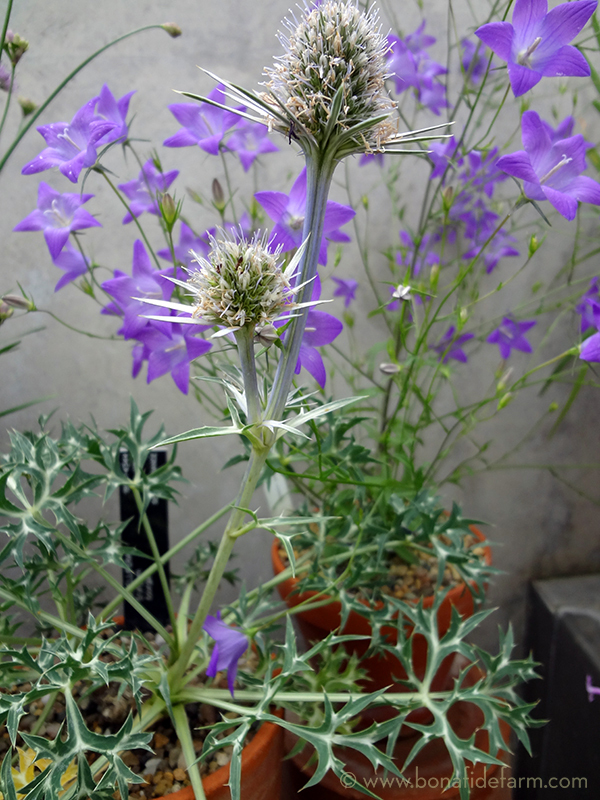 I can’t speak to any sort of research that’s happening at Kew, and can only appreciate it as a gardener. It’s definitely impressive, and huge, and though I’ve visited it twice on separate trips to England, I am sure there is still more to see. Far be it from me to cover it all in a couple of posts, so I will just focus on the areas most interesting to me. The structure above, to the left, is the newest glasshouse and one of my favorites. It’s the Davies Apline House, a rock garden full of all sorts of tiny little plants—most of them seeming Mediterranean in origin. I love how these small plants are basically served up on rocky platters, brought close for use to appreciate them in detail and in pleasing contrast to their rocky ledges. Can you believe that four full-time staff and one trainee are dedicated to the care of this glasshouse, which isn’t much larger than what you see in the photo? That is wonderful to me—so many talents and resources dedicated to such tiny plants in a little space. It was in this display that I found a spectacular oregano, Origanum amanum, from Turkey. 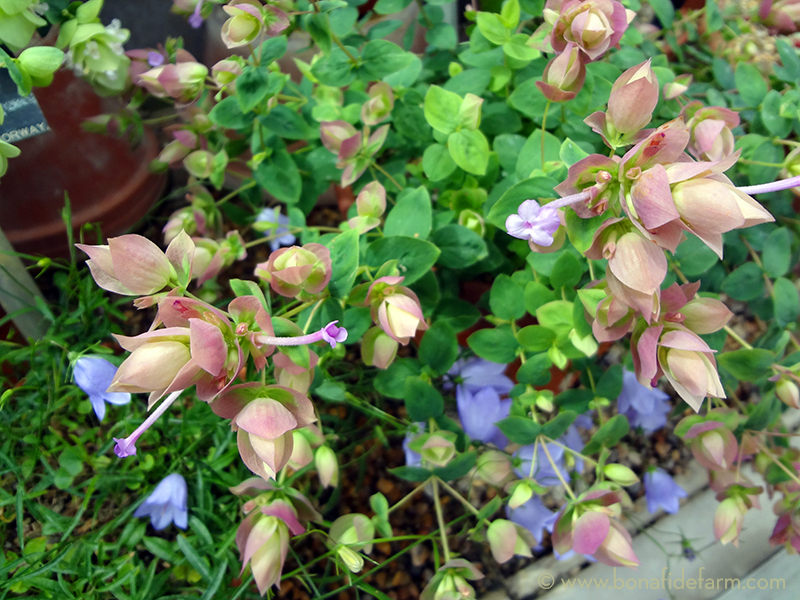 It’s similar to a hybrid ornamental I grow in my own garden, Origanum “Kent Beauty.” The blue flower in the photo is some sort of bell flower. 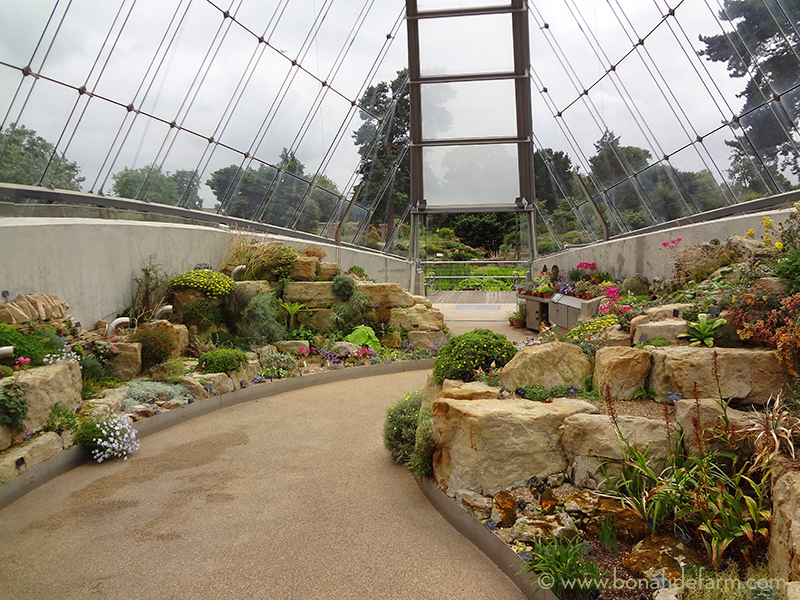 Just outside this glasshouse is an outdoor rock garden, which is one of my favorite areas of Kew. What I like about it, again, is how the rocks form a stage that elevate into the spotlight small and perhaps easily overlooked plants. Near this area is a series of great meadows planted with all sorts of grasses. I love the painterly effect of their intermingling, and that they would be relatively low maintenance. This is definitely an idea I’d like to try somewhere on my own property—once I can get past the on-the-surface foolishness of replacing a perfectly good natural meadow with a cultivated one! 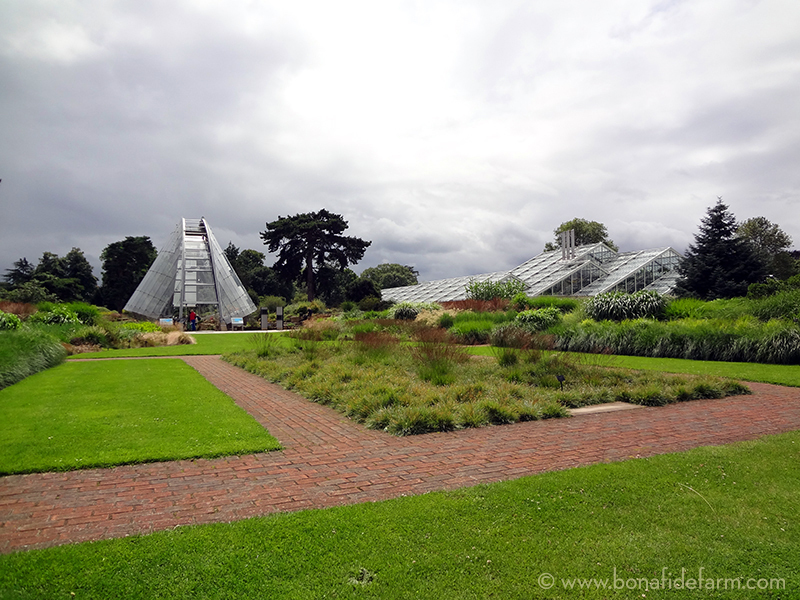 I won’t focus too much on the glasshouses, as I found them to be the least interesting part of Kew. They’re neat in that they’re old, and have lots of peeling-white-paint patina, but the plantings inside them just weren’t as interesting to me as what was going on outside. Perhaps that’s because I approach every garden visit with an eye toward what I can appropriate for Bonafide Farm, and a greenhouse full of tropicals just isn’t in my future. Although, funnily enough, my neighbors opened a winery centered on a giant greenhouse full of tropicals, so it’s certainly possible right in this mountainous little valley in Central Virginia. I couldn’t resist, however, this flowering vine growing in one of the glasshouses. I know not what it is, but isn’t it exquisite? If you can i.d. it, tell me in the comments, please! Up next in part two, walking the grounds of Kew, and getting some wood with the sculptor David Nash. 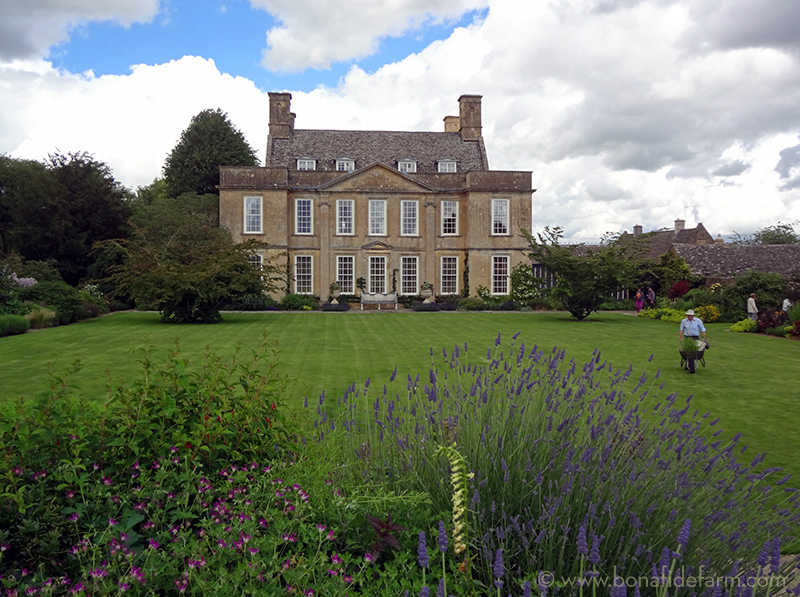 We continue our tour of Bourton House by focusing on a few details. 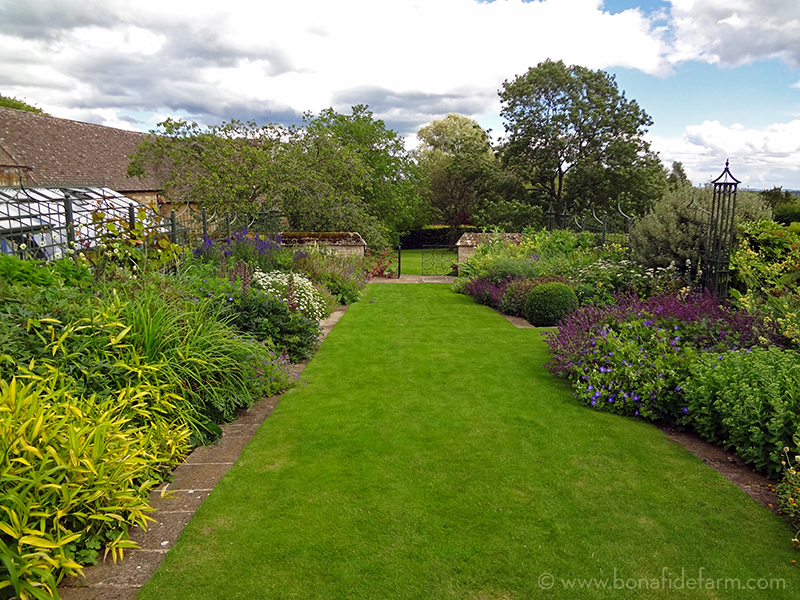 The image below is a good representation of what I just learned from Ursula Buchnan, in The English Garden, is the quintessential English garden: “informal and generous planting within a formal layout.” Such a simple definition but it cracked open a world of understanding for me. You can see the formal elements in the lawn bounded by paving blocks and in the wall at the far end of the path. 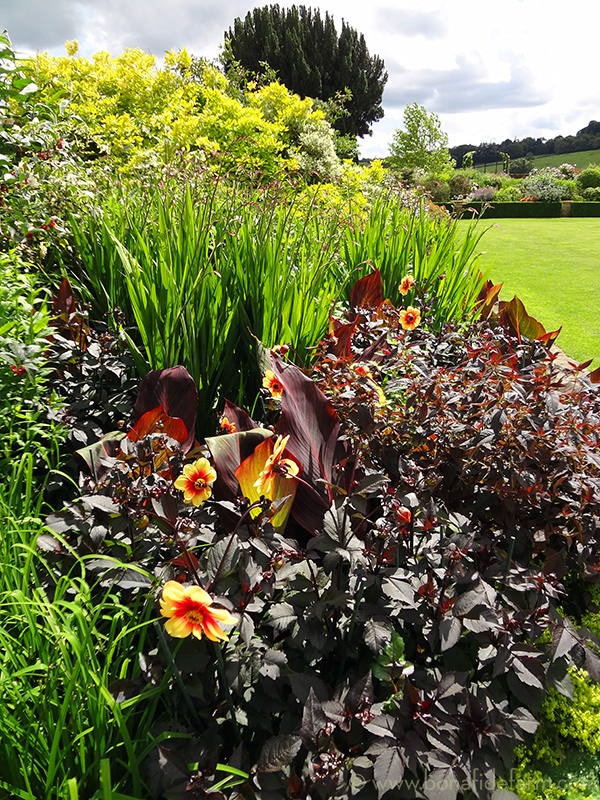 But the plantings within this structure are riotous—they range and blend together and overspill their bounds onto the lawn. Even though they don’t fit the “English garden” definition as well as the photo above, I loved the areas in the two following photos. The collection of succulents and specimen plants looks like something I do at my own house, when all my tender plants go outside to spend the summer on the porch of the well house. I loved the succulents growing out of the wall, below, which gave the effect of the plants on the ground literally climbing the walls. Someone with a great eye for color put this tiny masterpiece together. 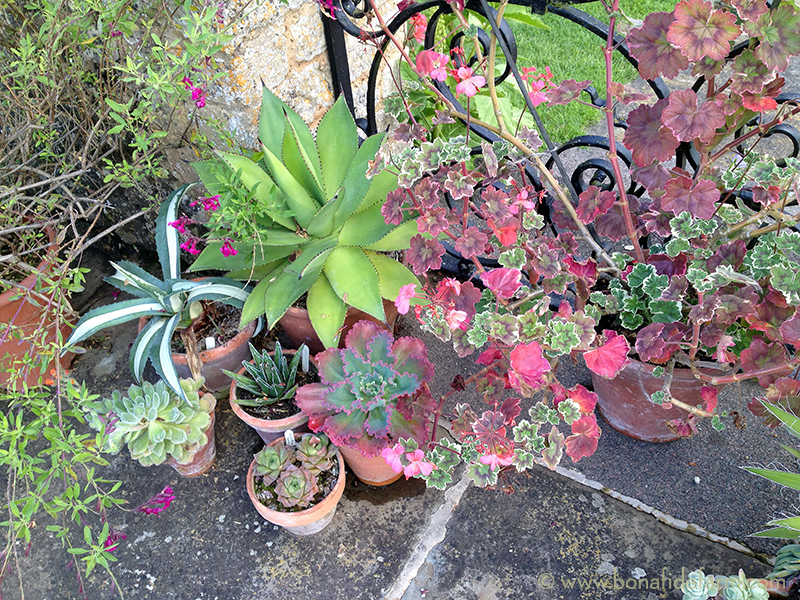 The shape of the geranium leaves (far right) really plays off the shape of the green and pink succulent in the center and makes for a unexpected and fascinating pairing. 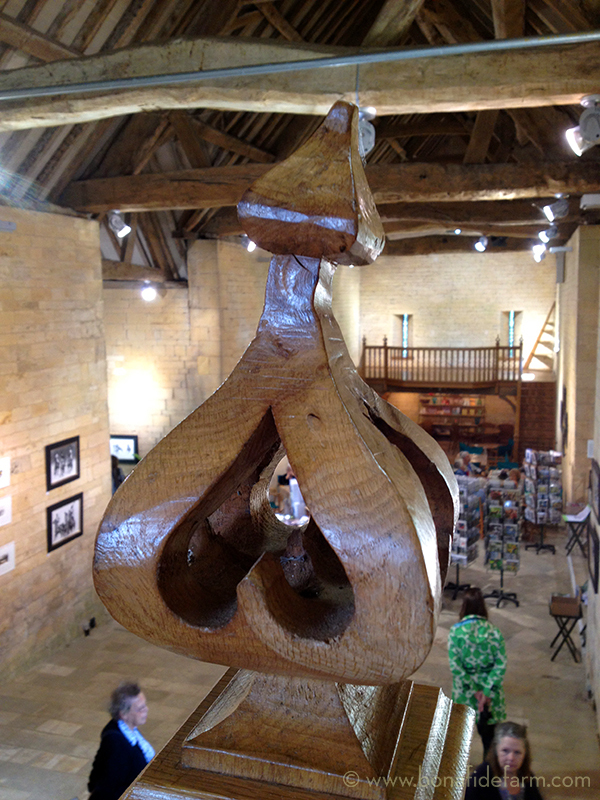 Next up, one of the coolest structures I’ve visited in England, the tithe barn adjoining Bourton House. It has a dedication stone of 1570 with the initials RP for the then owner, Richard Palmer. Back in the Middle Ages it was used to store the one-tenth of the farm’s produce that was tithed to the Church. What I loved about this space, which is now used as a gift shop and event space, was the proportions of the huge interior and the way the yellow Cotswold stone block walls joined to the plaster and beam ceiling. 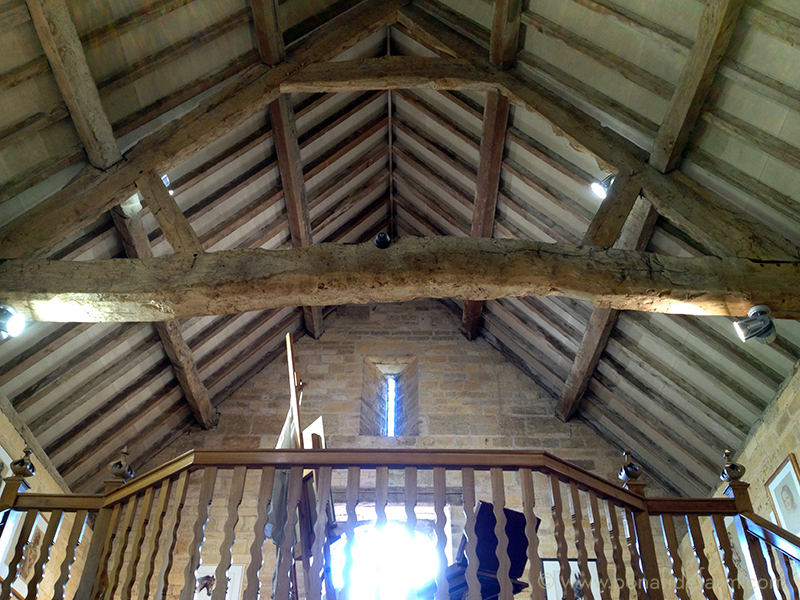 And look at these cross beams! They’re some seriously wonky, wormy, incredibly beautiful old wood. The detail on the balcony railing was also particularly nice, with the wavy balusters. The finials were my favorite—hand-carved and crooked in a wonderful way that made them appear full of personality. And finally, the mixed shrubbery planted along the exterior of the Bourton House fence is another master class in combining foliage colors. Some day, something like this is what I’ll do in the field between my house and my neighbors, in front of the screening trees that I planted a few years ago. At least this is the vision! It’s cold, dark and raining—you know, typical winter—and I’m seriously missing hours spent in the garden, not to mention the antidepressant effect of playing in the dirt. 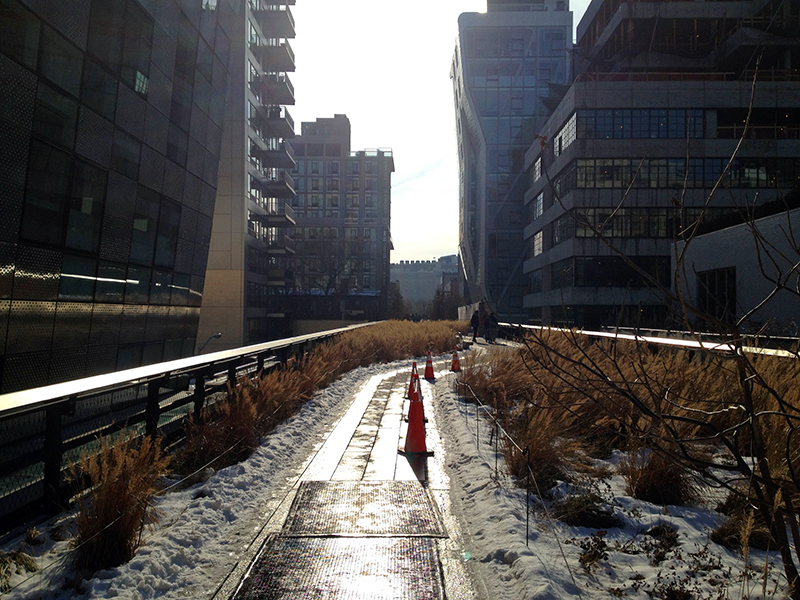 I really liked writing about the High Line a few weeks ago, and it made me realize that I have untold stories of other equally wonderful gardens. Because of that, and because nobody wants to read a post on how I’ve spent the last two days regrouting my shower, let’s get out of here and find something pretty with a short series on some of my favorite gardens that I’ve visited in the past few years. 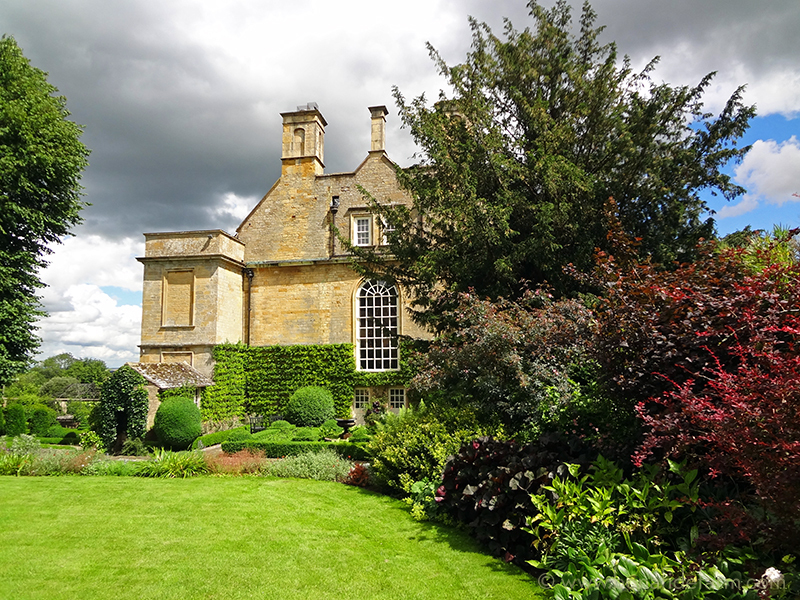 First we’ll go to England and visit Bourton House, right in the beautiful Cotswold countryside near Morteon-in-Marsh. 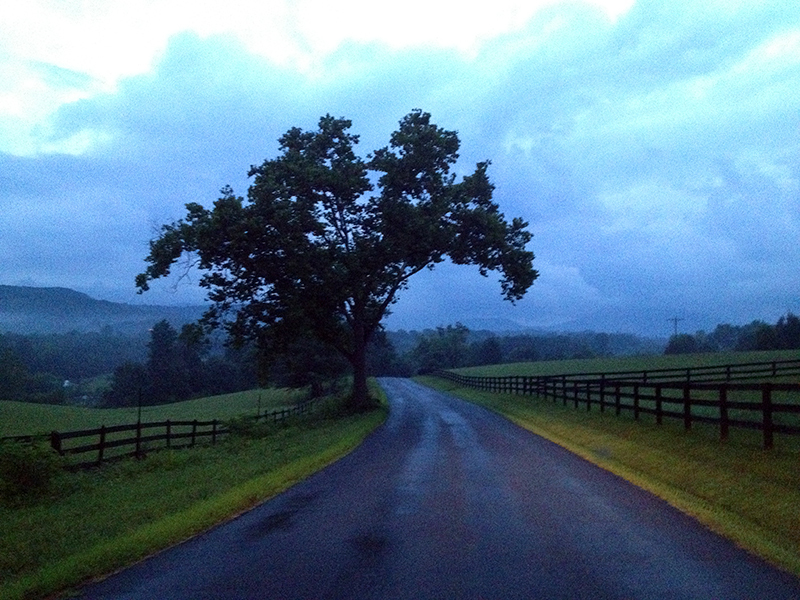 I stayed in this area for a couple of weeks in July, 2012, and took these photos then. Built on monastic lands, Bourton House and its Brewhouse, Stables and Coach House have created a courtyard since the late 16th century. The house itself was rebuilt as a foursquare Jacobean house by the eminent lawyer, Sir Nicholas Overbury in 1598. At the beginning of the 18th century, the then unfashionable house was once again rebuilt on the earlier footprint by Alexander Popham, the grandson of a Cromwellian general. The house was taken down to its lower ground floor but the whimsical towers retained, the slits replaced by generous Georgian sash windows. The architect remains unknown. This setting has remained unchanged for three hundred years. The lands originally belonging to the manor were sold in 1851 by Sir James Buller East MP, to the neighbouring Sezincote estate. 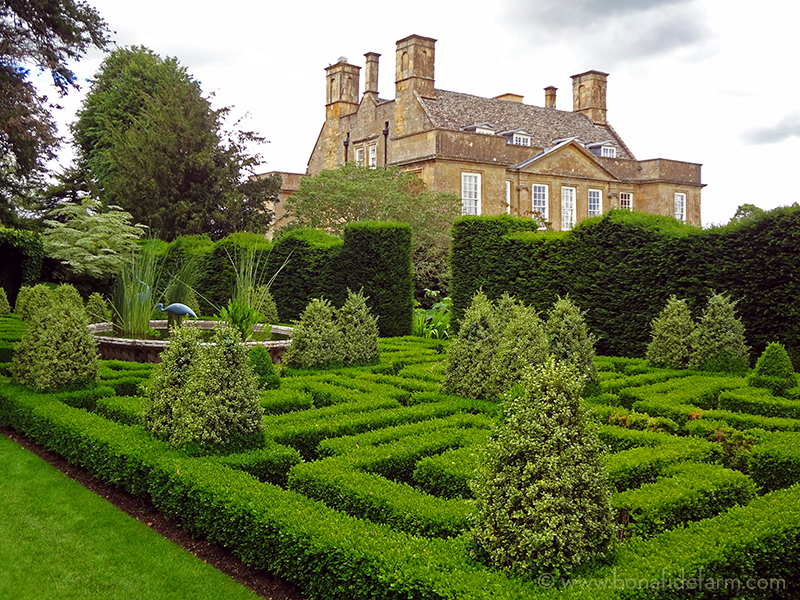 Today Bourton House is surrounded by its immediate three-acre garden and a seven acre walled pasture, now given over to specimen trees and sculpture. In 1953 the house and land were sold at auction and there followed a quick succession of owners, six to be exact, until 1983 when the house was acquired by Richard and Monique Paice. 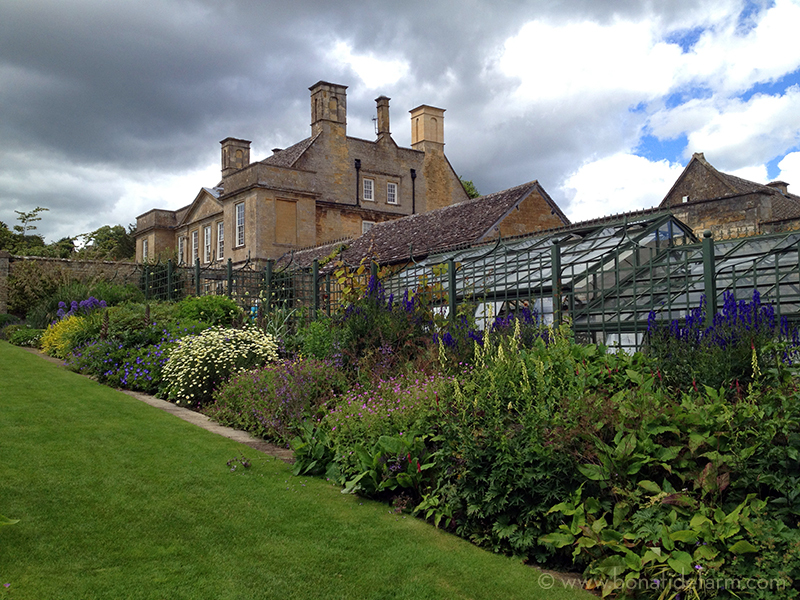 The ornamental garden with its 18th century raised walk overlooking the rolling Cotswold hills; the original kitchen garden and orchard have been transformed in the past twenty five years. 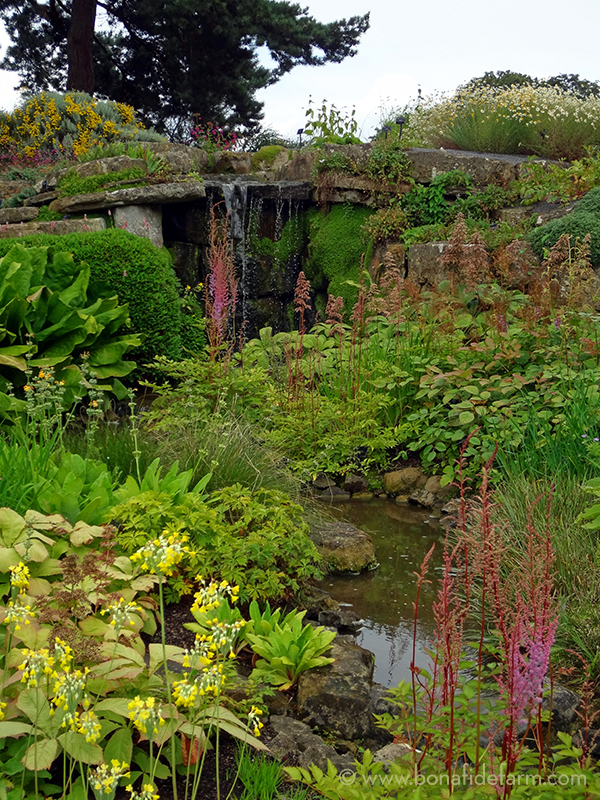 This achievement was recognised when Bourton House Garden received the prestigious HHA/Christie’s GARDEN OF THE YEAR (2006) award. In 2010, the house was sold. 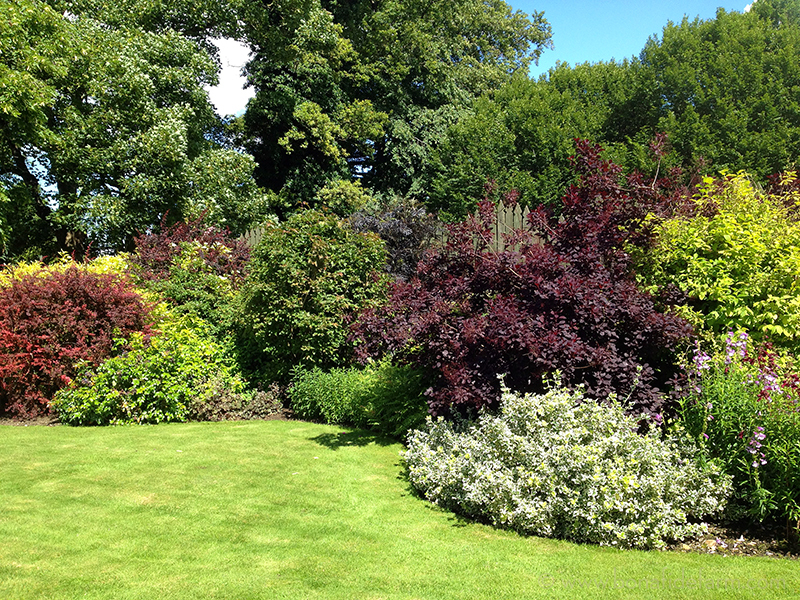 The new owners have decided to keep the Garden open to the public with the active help of Head Gardener Paul Nicholls and Assistant Gardener Jacky Rae. Paul and Jacky have been responsible over many years for turning vision into reality and creating the wonderful garden seen today. 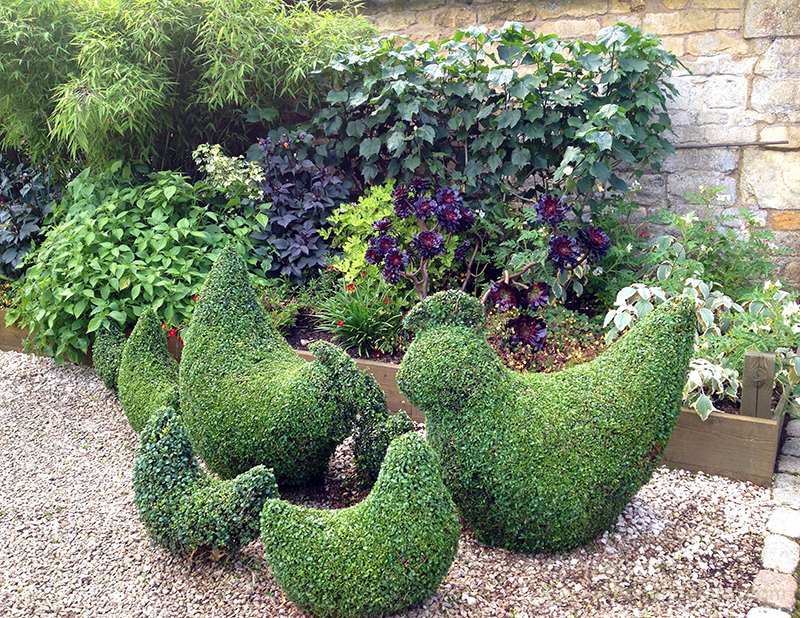 I was really impressed by the use of contrast in the Bourton House garden. 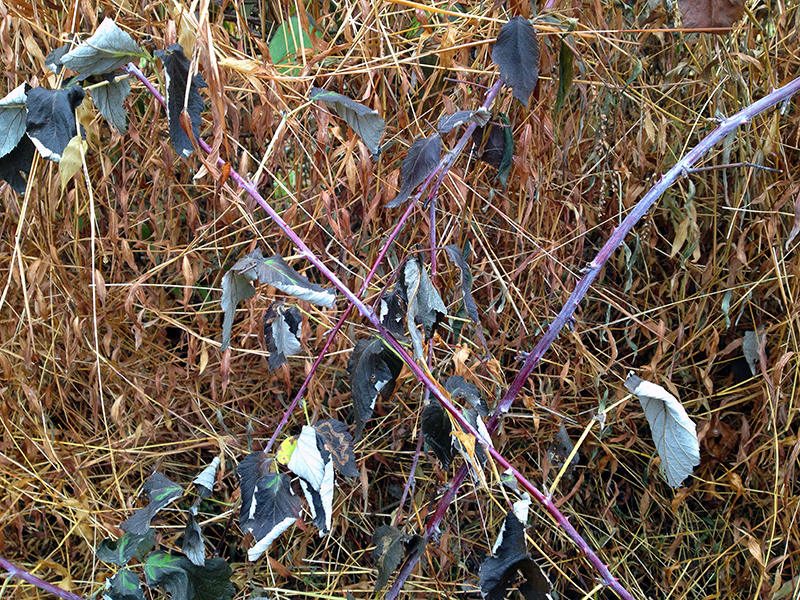 As you can see in the two photos above, plants with dark foliage (dahlia and canna up above, and barberry and some other now-unidentifiable things below) are used to break up the swaths of pure green plants and grass. 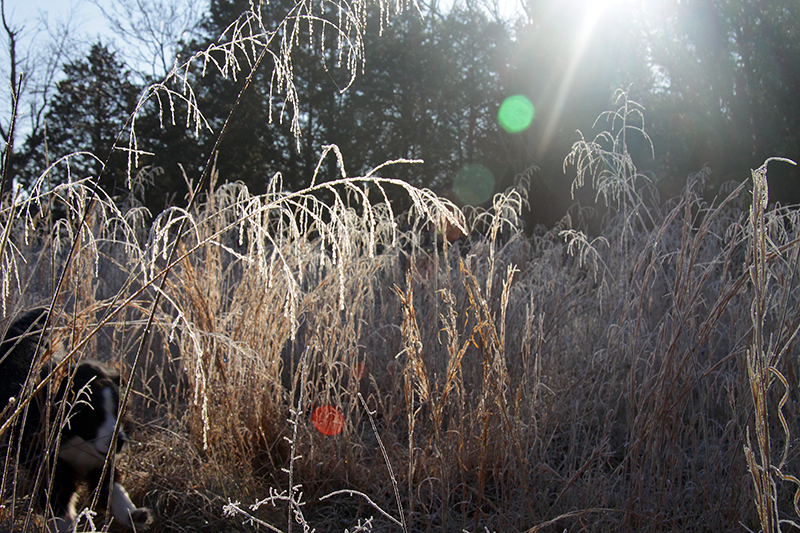 The dark plants create the effect of shadow even in full-sun exposures, and increase the visual depth of the borders. 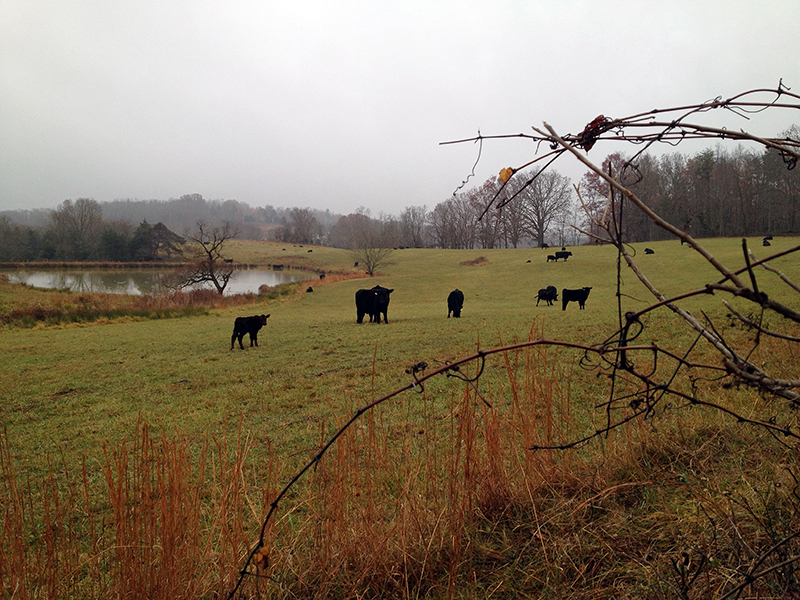 The estate is surrounded by pastures filled with sheep and cows. It was lovely to hear their soft grazing noises while walking the grounds, and they’re very pretty lawn ornaments! Although I know firsthand that the day-to-day caretaking of livestock can often be the very opposite of bucolic, it was nice to dream a bit and aesthetically appreciate these animals without having to worry about their care. 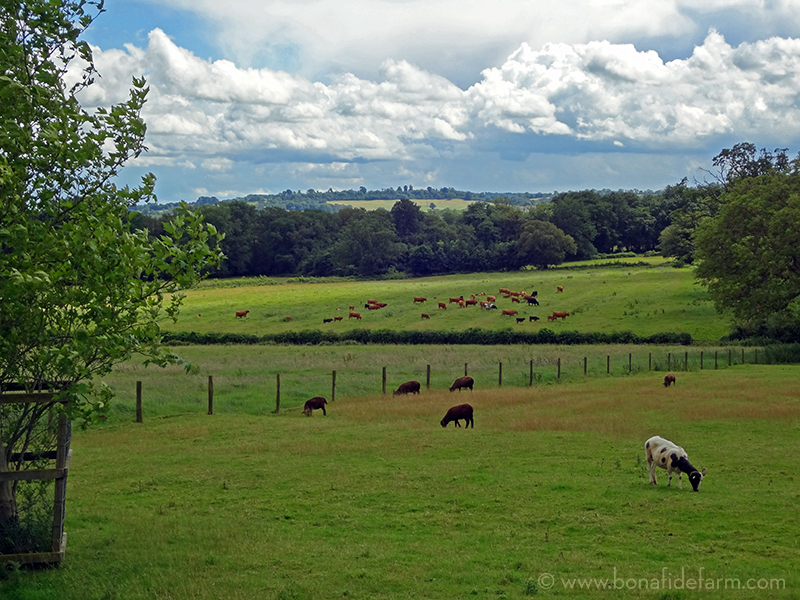 I was impressed by how dynamic the clouds, sky and weather were in England during my visit. You can see in this series of photos, taken in just a couple hours, that the sun moved in and out from behind the clouds. Rain came and went as showers passed by. 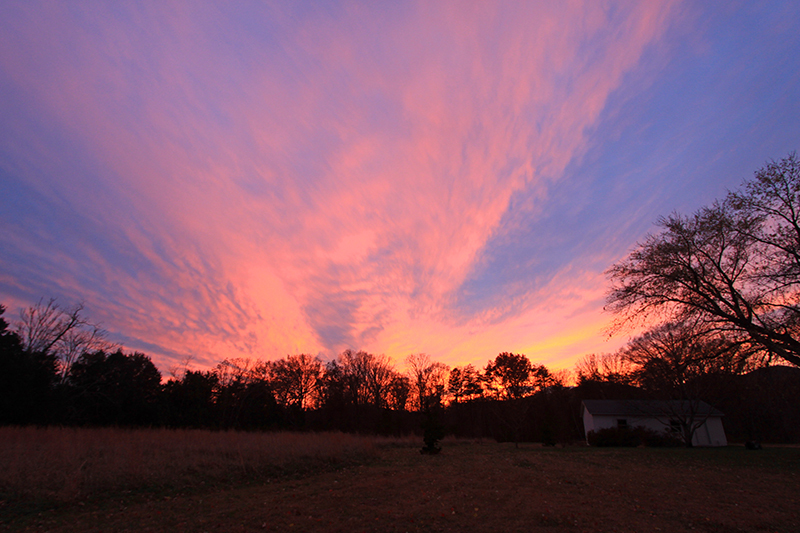 This made photographing fun and challenging, and the skies were never boring. It also made everything green, green, green! 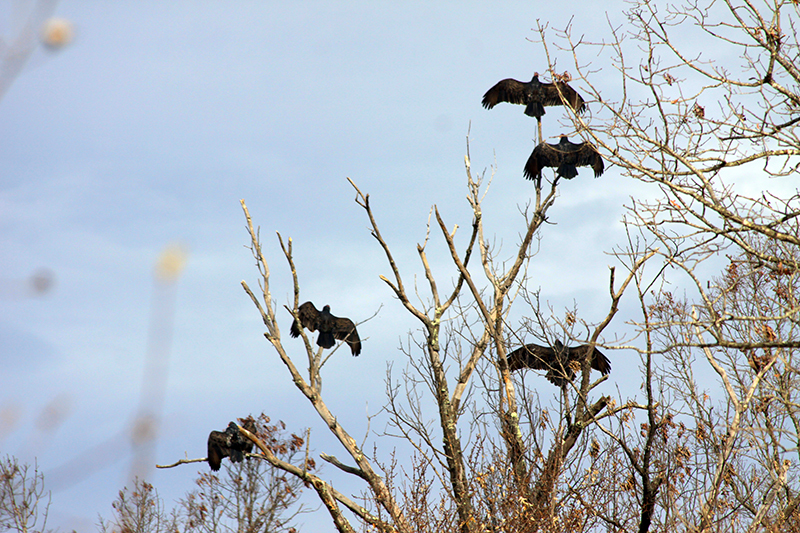 Just looking at these photos is already helping to alleviate my winter doldrums! 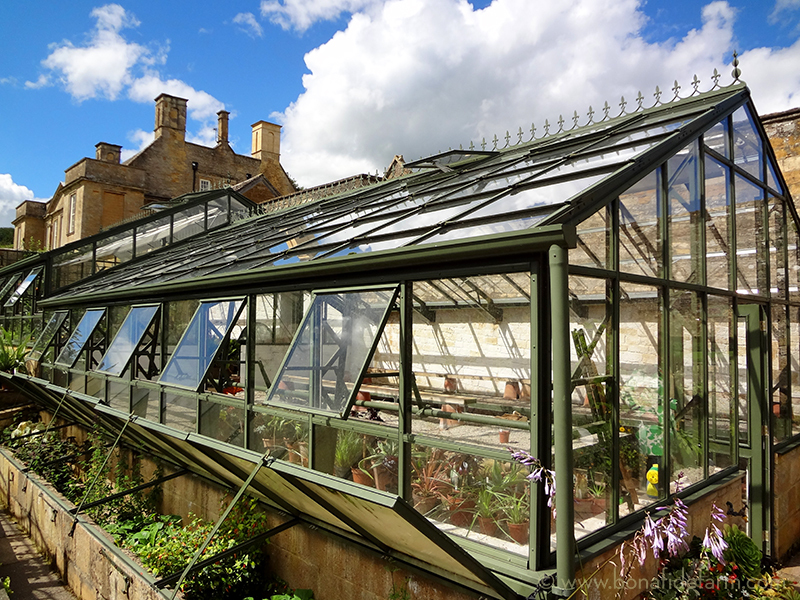 The beautiful glass house wasn’t full as it was high summer in England when I visited, but I can imagine how wonderful that space would be when used to start seedlings and extend the season into fall. Cold frames, below, are built up against the foundation of the glass house and are open to the sun. I love how the more modern glass house is incorporated into the ancient compound without it feeling intrusive or out of place. It’s a good lesson in proper scale and the wonderfully camouflaging properties of dark green paint. 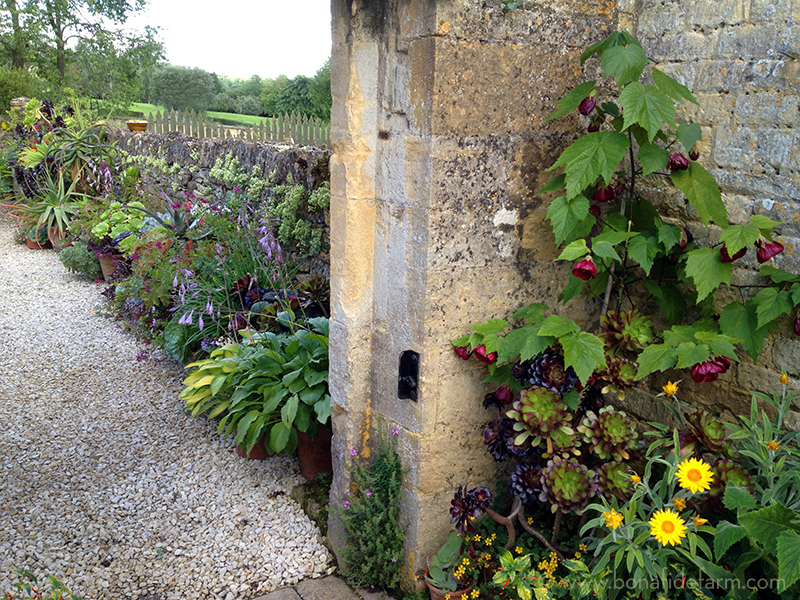 Up next: We examine the Bourton House garden in closer detail, and step inside a gorgeous 16th century tithe barn. 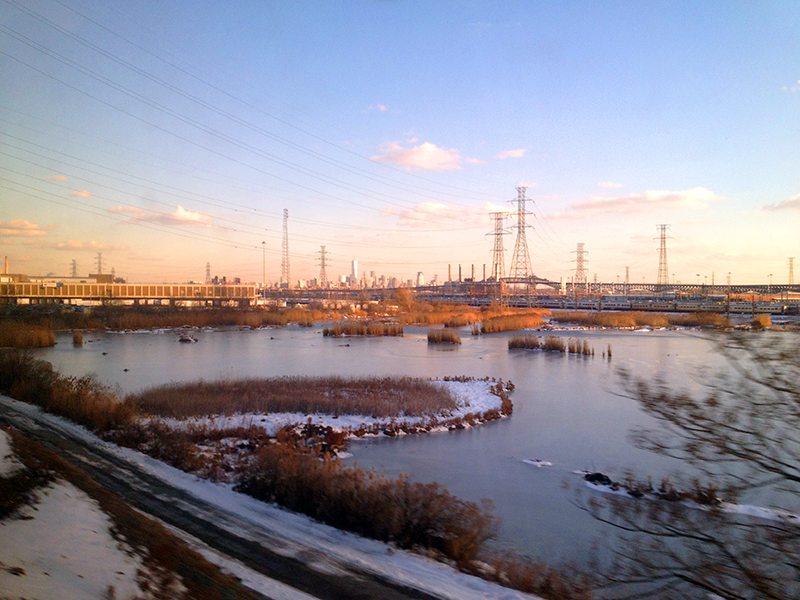 Last week I took the train up to Connecticut to visit a friend and caught this view approaching Manhattan. I like how this photo plays with scale, the skyscrapers of lower Manhattan dwarfed by the towers in the forefront, and all of it seemingly floating on a frozen marsh. 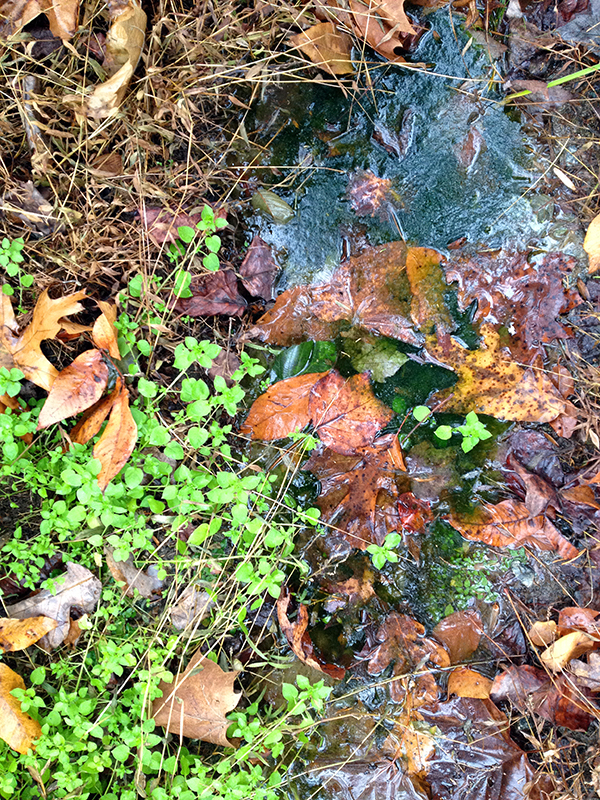 Nature below, manmade above. You can see the Freedom Tower catching the sunset. I think the design is simple but very elegant, and I really like how the light plays on its different sides. 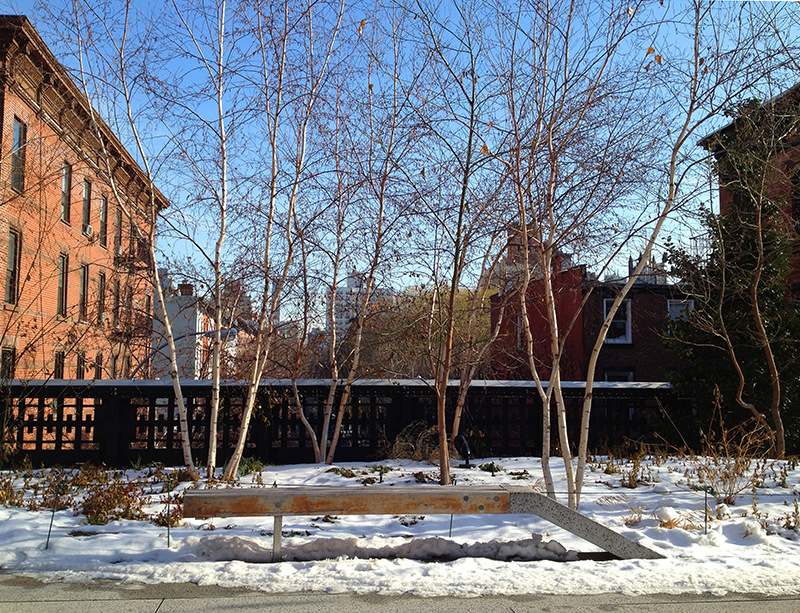 From Connecticut, we took the train into Manhattan for a day and our first destination was the High Line, a public park and garden with planting design done by my favorite garden designer, the Dutchman Piet Oudolf. 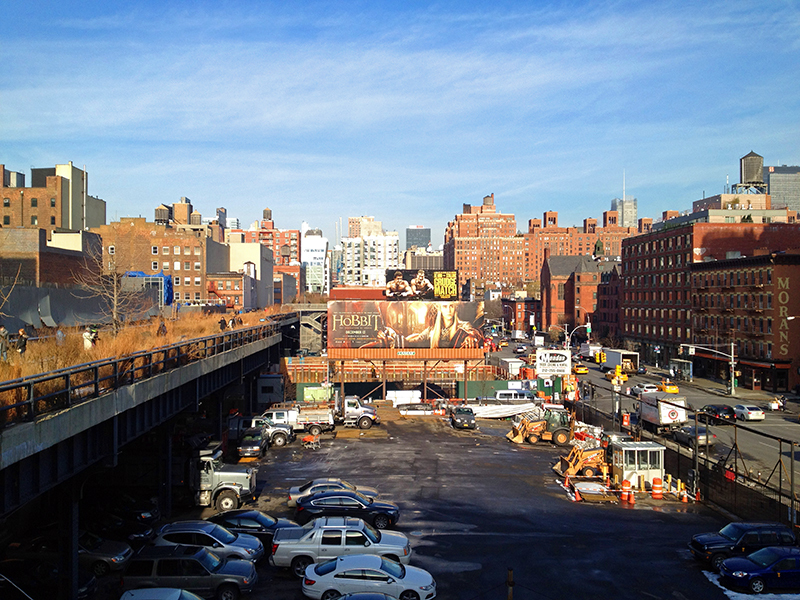 The High Line used to be an abandoned, overgrown elevated railway until the Friends of the High Line got together in 1999 and garnered enough public support for the park that in 2004 New York City granted $50 million for the project. The park has been completed in sections since then, and it’s achieved worldwide recognition for its success at transforming urban blight into public greenspace, and revitalizing a formerly decrepit area of the city. 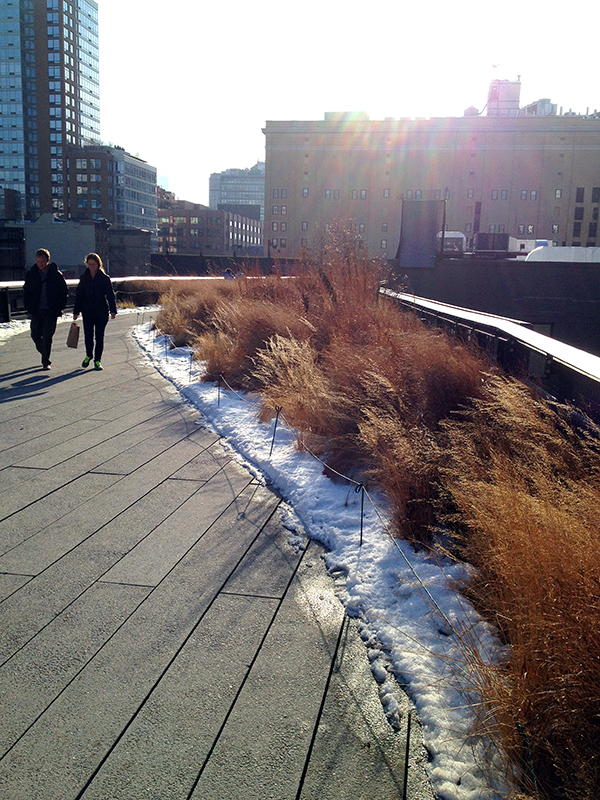 Chicago, Philadelphia and St. Louis are studying the High Line as a potential model for their cities. All this to say that although I’ve followed this project for years, I hadn’t actually gotten the chance to visit until last week. And I was so impressed. The hardscape materials—steel, glass and concrete—were combined with enough weathered wood to warm up the garden without losing touch with its urban environment. I loved the little alcoves that jutted off the main path. They formed garden rooms that would give a gathered group of friends a sense of intimacy while still allowing them to be part of the action. And of course, the plantings were awesome. 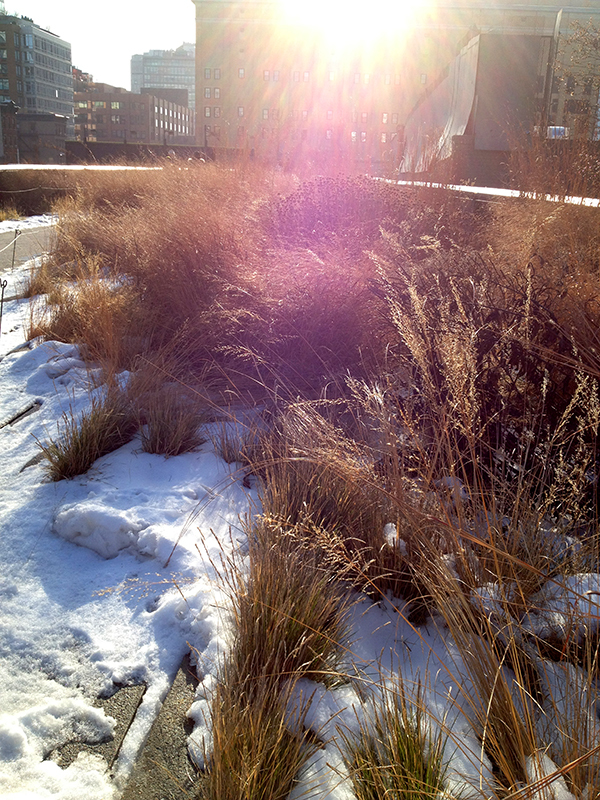 I know enough about Oudolf’s work to expect a lot of grasses and dried seedheads this time of year, and the High Line didn’t disappoint. 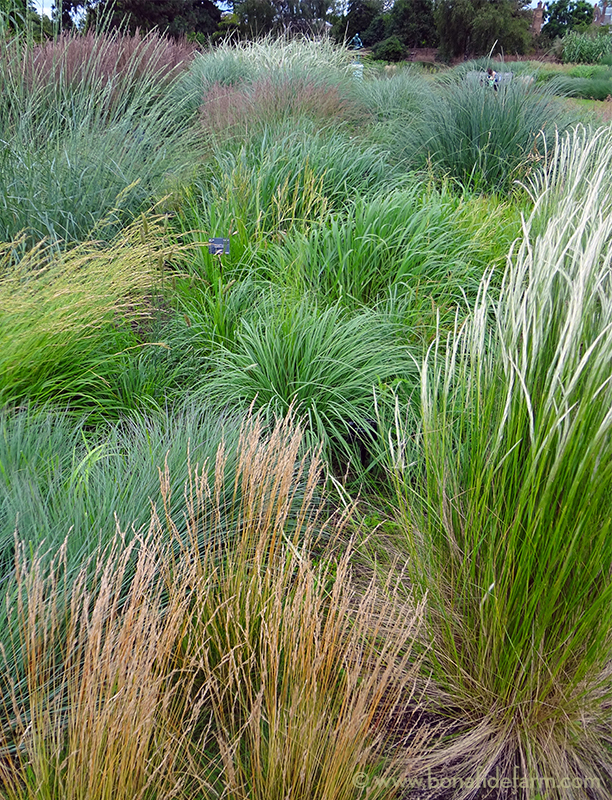 Oudolf designs for four-season interest, and I suspect that the dried plant material and stark, berried bushes we saw in winter might be even more interesting than the abundant but overplayed flowers of summer. A blanket of snow threw all the plants into beautiful relief and was an extra bonus. I know “naturalistic,” “new perennial,” and “meadow” planting are so trendy in garden design right now, and I also know just how much work and knowledge it takes to put together a garden design that replicates a natural meadow. 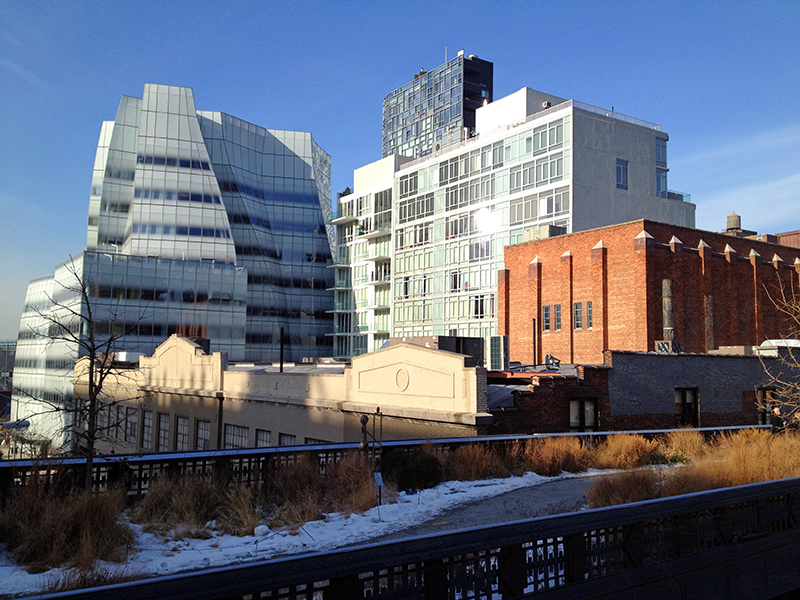 But I was really struck, as I walked the High Line, by how it looked like one could have just transplanted a section of my front yard right into Manhattan. 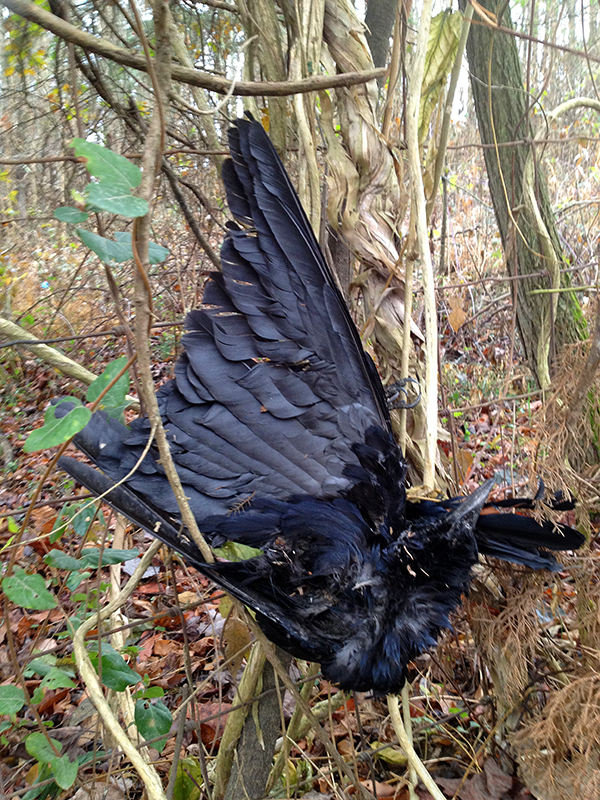 If that was Oudolf’s intention, and I believe it was, no doubt he succeeded. And maybe I succeeded too, by setting up my home in a natural, beautiful meadow without having to plant it first! Art imitates life, life is—if we keep our eyes open—art. 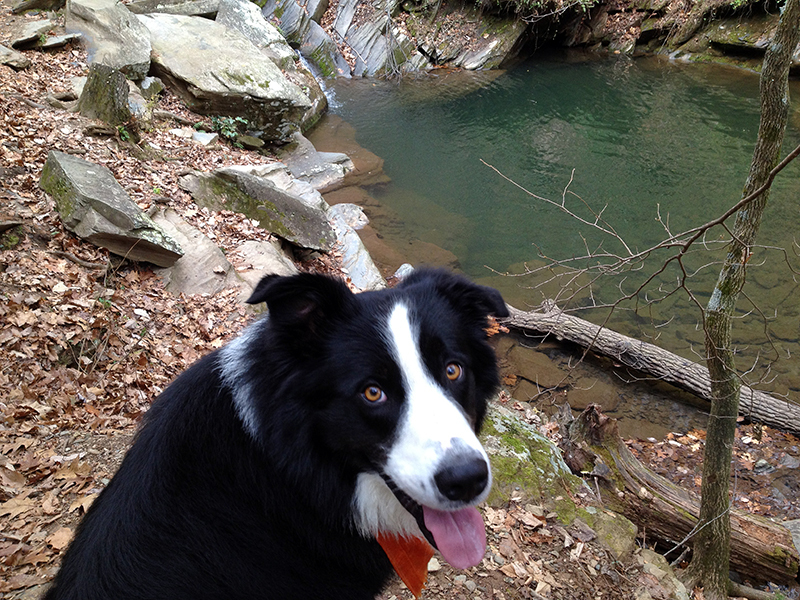 A friend and Tuck and I took a long hike up to Blue Hole and further up the mountain to Shenandoah National Park. Tuck in one of the swimming holes along the North Fork of the Morman’s River. 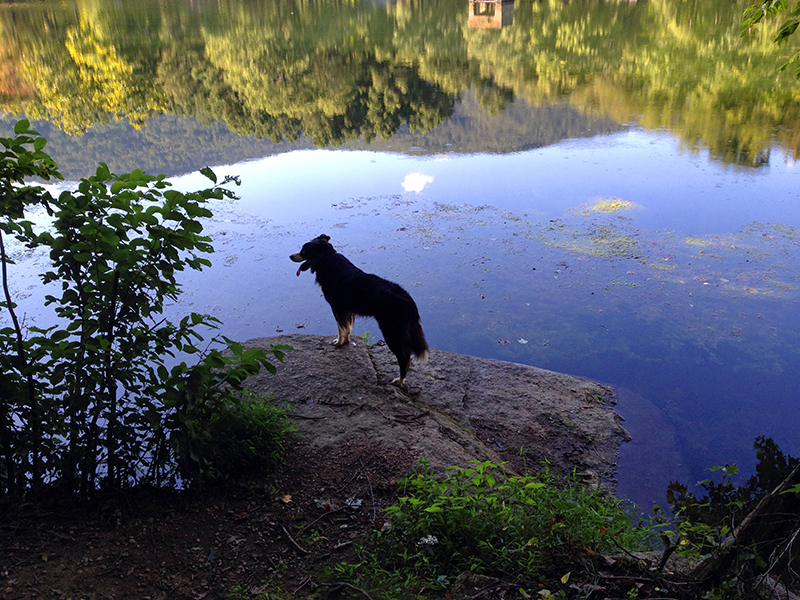 It hasn’t rained in a long time, and the water was low and crystal clear, the rivers easy to cross. 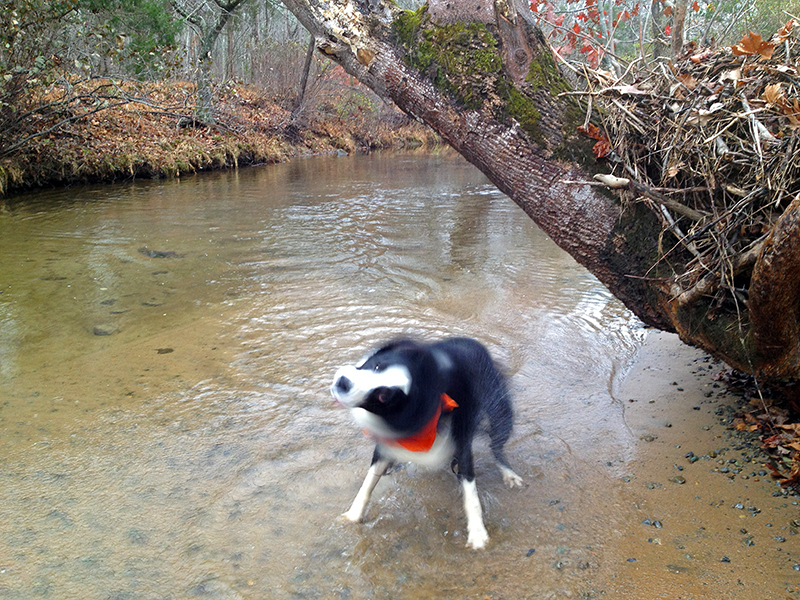 This is the first and last time during the hike that Tuck got totally submerged. 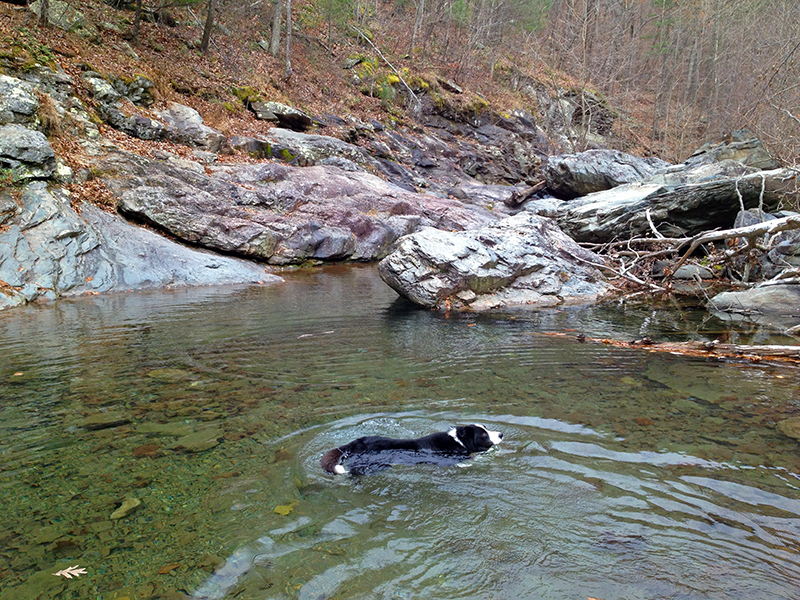 He figured out pretty fast that mountain streams in late November aren’t the same temperature as they are in summer! 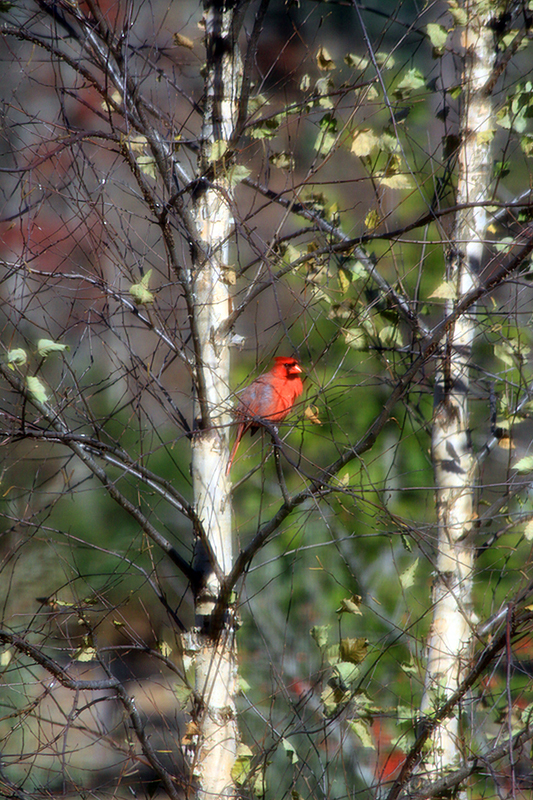 The last of the fall color. 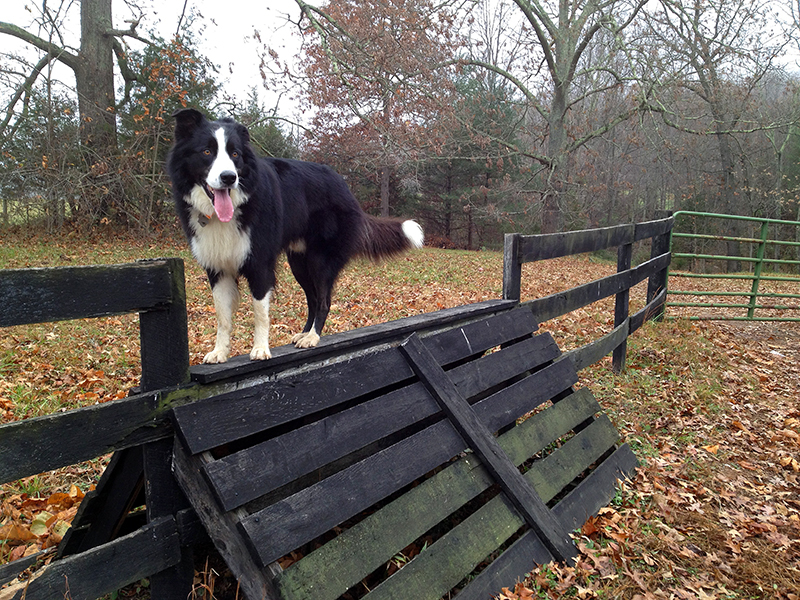 Just about all the leaves are down now, and it’s looking very wintery. 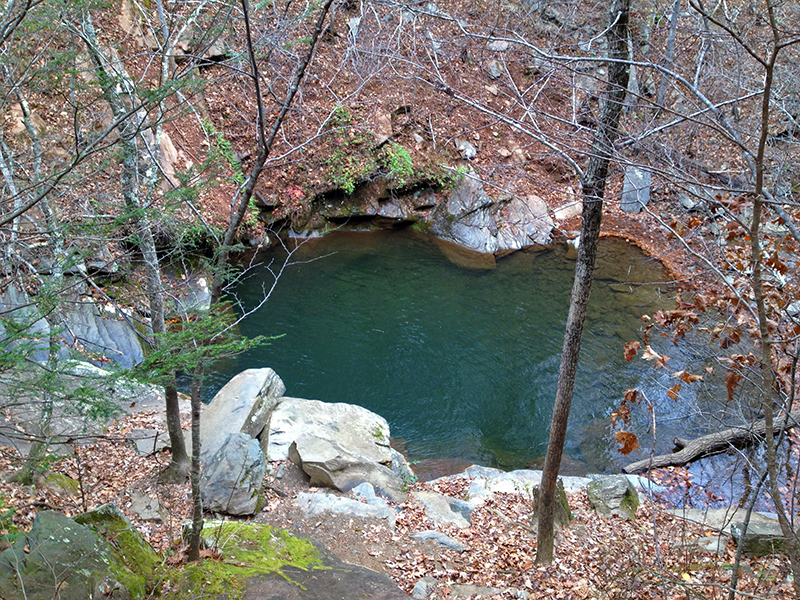 Blue Hole. 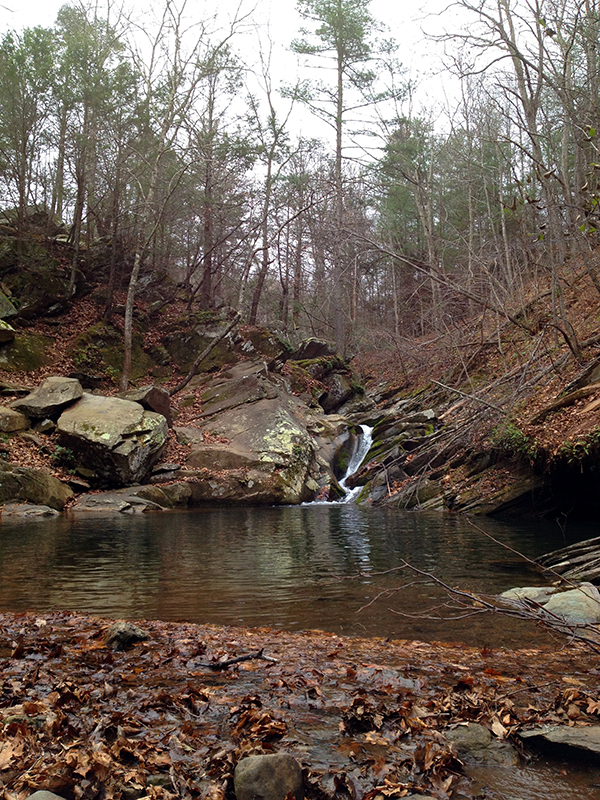 This is where my friends and I did most of our swimming growing up. With the water snakes, timber rattlers, copperheads and ticks. 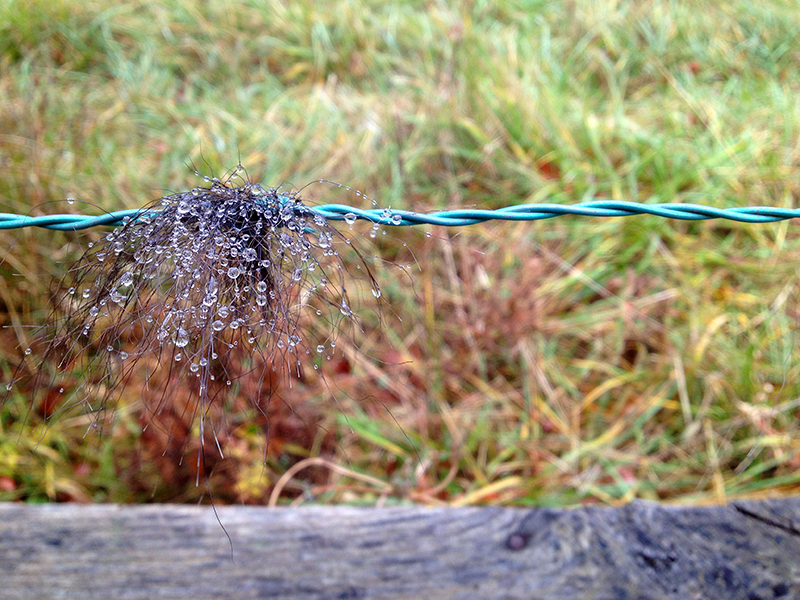 Rural childhood. You can jump off those big rocks below and not hit the bottom of the hole. Yesterday I gave away one of the roosters that hatched this past summer. 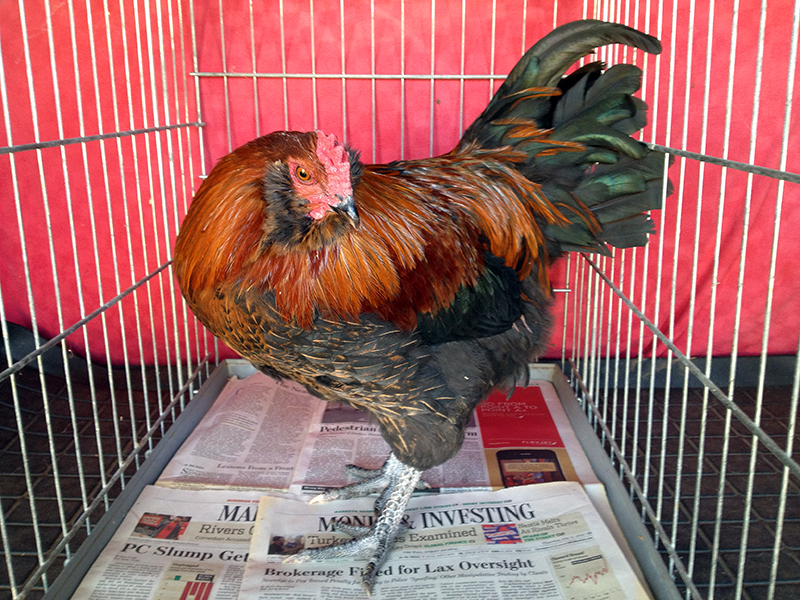 He’s turned into a handsome guy, but there’s no way I need three roosters in a small coop. 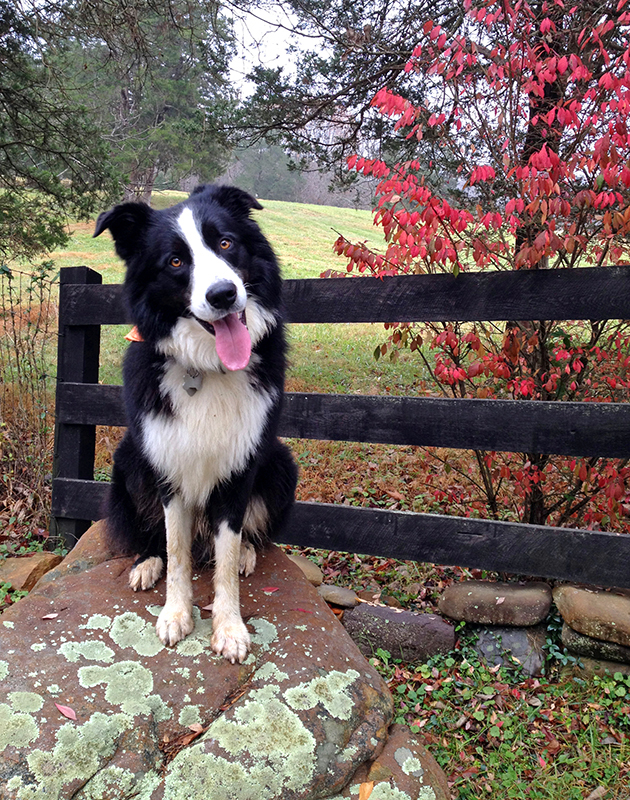 This guy went home with a jolly lady and her young son—found via CraigsList—to rule over his own flock of hens. So he’s on to a better life, and I am happy about it. I knew he would be well-treated when his new owner asked what he prefers for treats! HA! 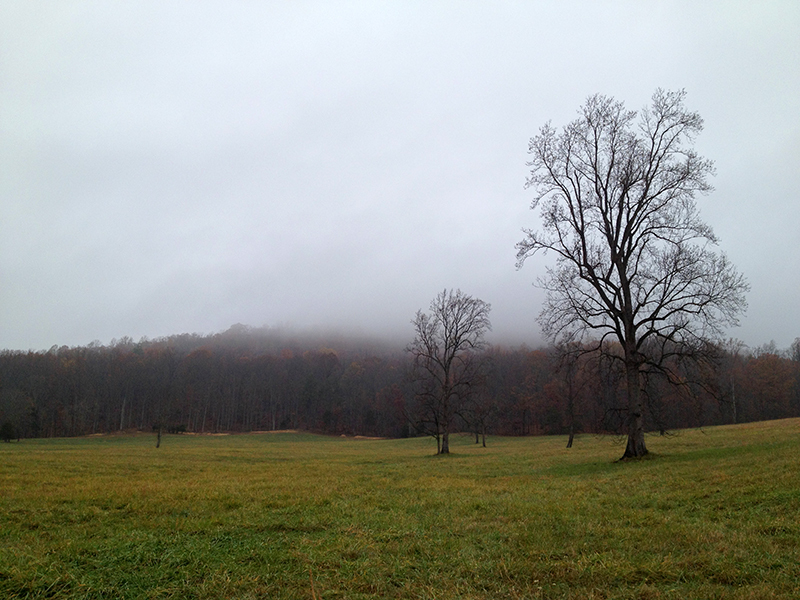 The brilliant fall colors and blue skies of a week ago are gone, replaced by dark and fog. It’s so socked in that the chickens put themselves to bed before four in the afternoon, and I haven’t seen the mountain in my front yard for two days. After lots of computer work this weekend I had to tear myself away from the woodstove and get outside. 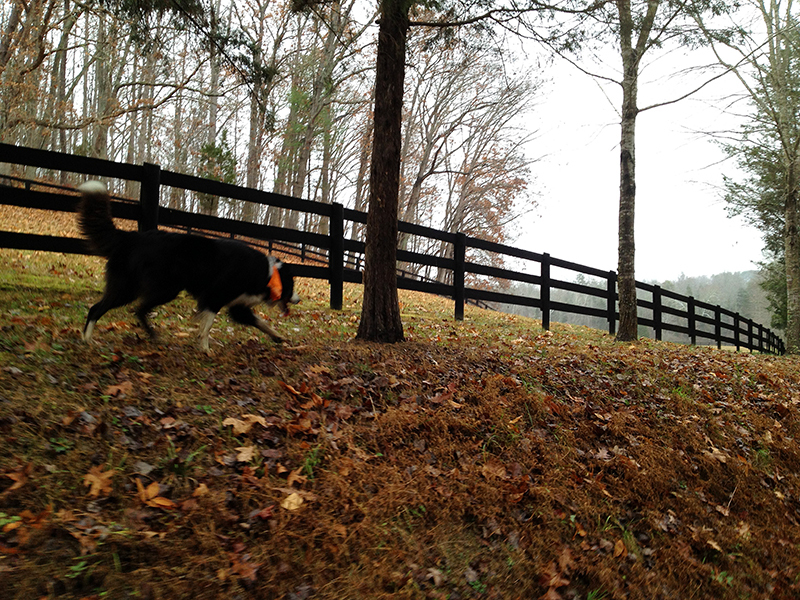 I loaded up Tuck and we drove a short way from my house for a muddy, mizzly walk that brought to mind similar tramps across the English countryside. I am really struck by how much it looks like winter now. 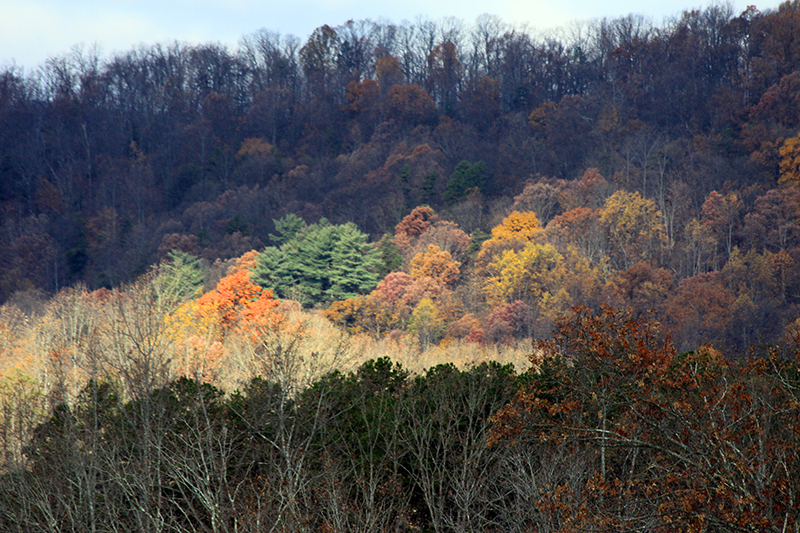 There are a few hints that we’re just tiptoeing over the starting line of the season, such as the still-green grass and the last of the dangling, russet leaves, but it’s really clear now that this will be the view for many more months. Here’s to making the most of it, and trying to find its subtle beauty. Ever since I moved to Bonafide Farm, I’ve wanted to grow hops. But the infrastructure always stopped me. 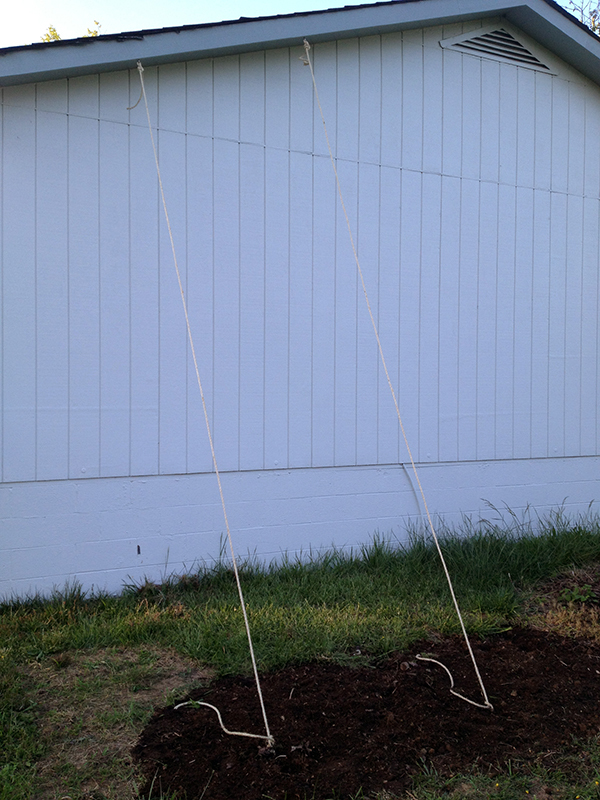 Hops are vines (actually, botanically they are bines) that will grow 20′ or more, and need trellises that I just didn’t have the energy to conceive and build. But in mid-April I was down in Nelson County, which is now regionally acclaimed for its breweries (Devil’s Backbone, Blue Mountain, etc.) enjoying a post-hike flight at Wild Wolf with some friends. A sign at a shop across the patio advertised hop rhizomes. I couldn’t resist. Turns out I had discovered HomebrewZ!, a delightful little shop stocking all your homebrew essentials. A very lovely woman sold me her last seven Cascade rhizomes and instructed me to “go across the way” to speak with another woman who would impart all the secrets of hops culture to this neophyte. I got the skinny from this sage and rejoined my friends and our dogs on the patio. 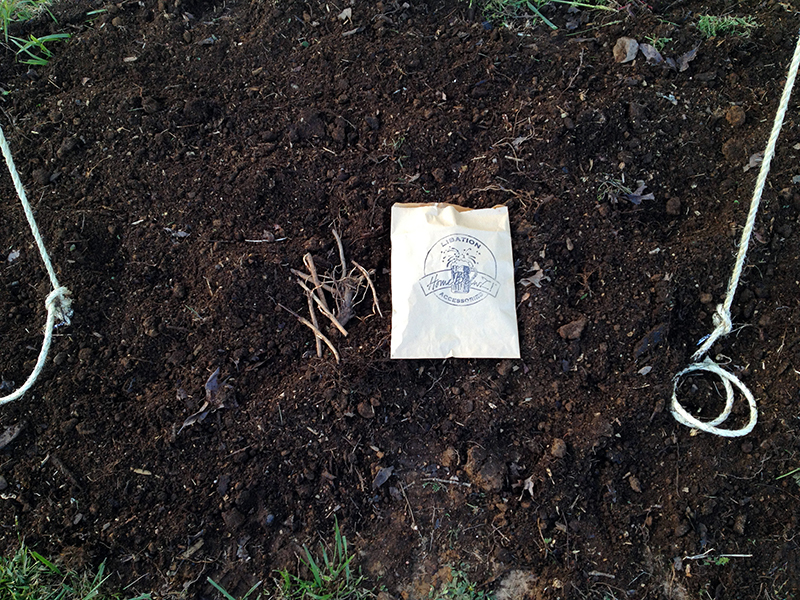 The rhizomes,which are nothing more than 3-4″ twigs, languished in a paper bag until I could do a little research and make a trip to the hardware store for supplies. Then my friend Simon and I spent an evening hauling forest topsoil and compost to the site of an old berry patch by the south side of the garage. 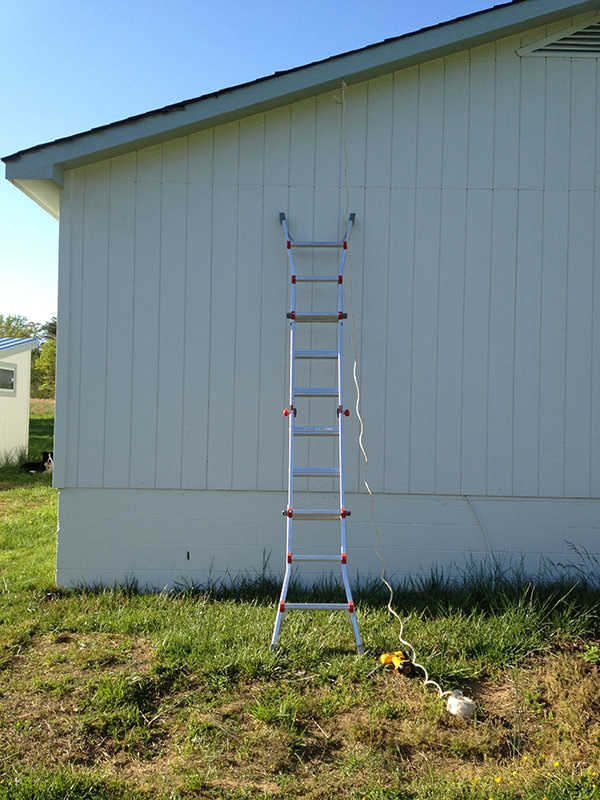 Once we had the soil nice and juicy (hops are heavy feeders with an extensive root system), I mounted the ladder, drill in hand. Right up under the eaves I installed two stainless steel eye-bolts. 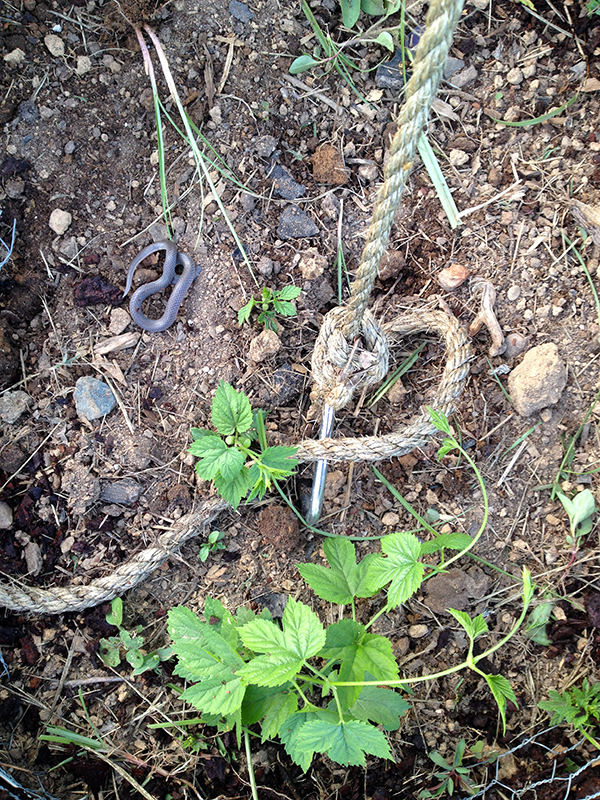 Then I ran 3/8″ sisal rope from them down to dog tie-outs that I’d screwed in to the growing bed. 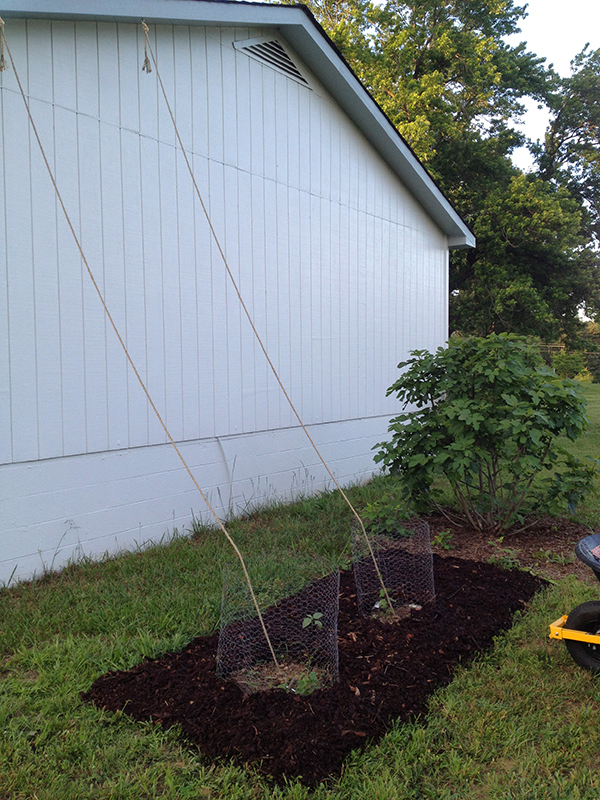 And this was the extent of my trellis system. One of the best things I have learned from living here is that sometimes things work out best when I am just pushed to react to what a situation demands, instead of obsessively planning to the point of inaction. I arranged the rhizomes in the soil around each tie-out, covered them over, and hoped for the best. A few weeks passed with no change. Just as I began to worry that I’d gotten some dead rhizomes, tiny leaves appeared. And then there were more. I made chicken wire cages to keep the chickens from eating the hops, and in a few days more sprouts appeared. And then I went away to the beach for eight days, and when I returned my little hop babies had found their ropes and started to twine. So precocious! Unfortunately the pasture was fast overtaking this nice, rich new bed, so last weekend I dug out all the weeds, laid down newspaper, and piled mulch on top. This will keep the weed pressure off my hops so they can grow to their max. That’s my Celeste fig next to them, which came through this winter without any intervention from me and is on its way to becoming a beautiful asset. I found another little snake in the mulch. 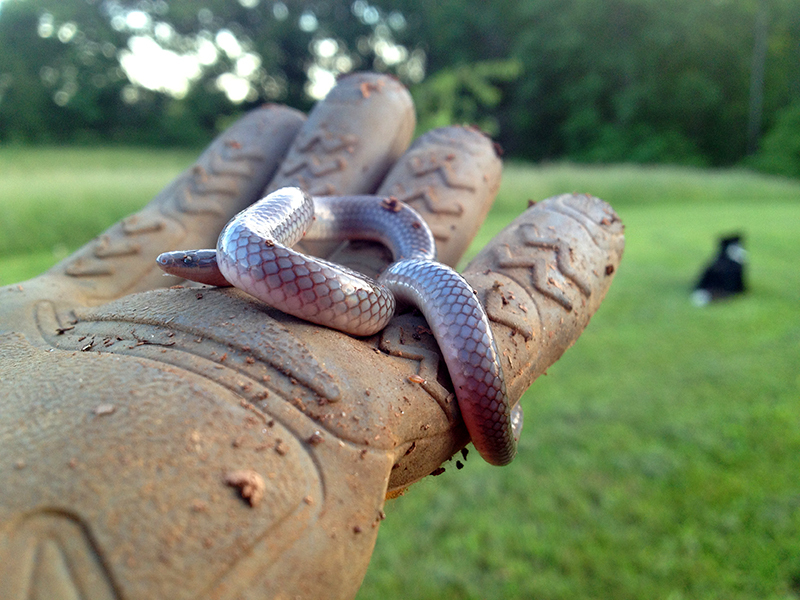 This is the second “mulch snake” I’ve encountered. I placed him next to the growing hops. I figured twiney things belonged together. You are currently browsing the Off the Farm category at Bonafide Farm.